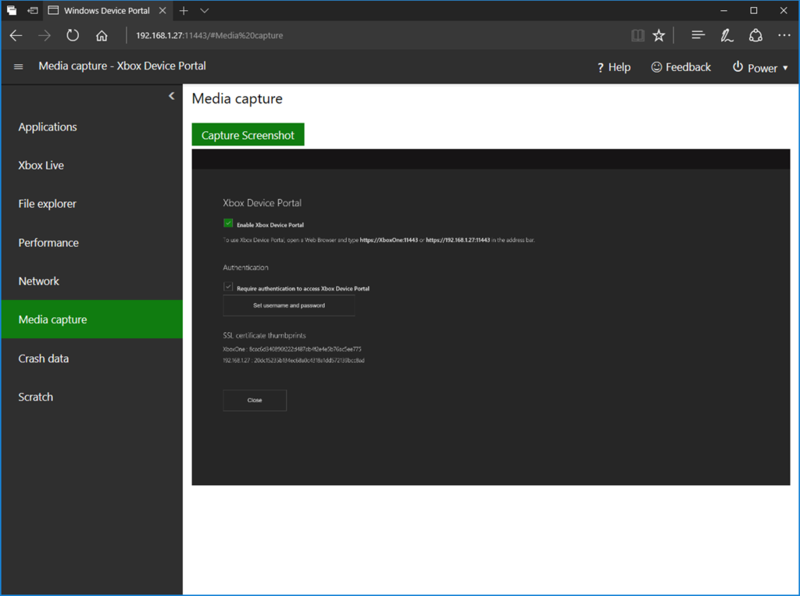 We’ve been doing a bit of work building out an Xbox app and part of the fit-and-finish of any app is aligning the application layout with those of the designs. One of the easiest ways to do this is to take a screenshot of the app and then mark it up alongside the original designs, which are hopefully high enough fidelity to allow you to do the final round of tweaks against. 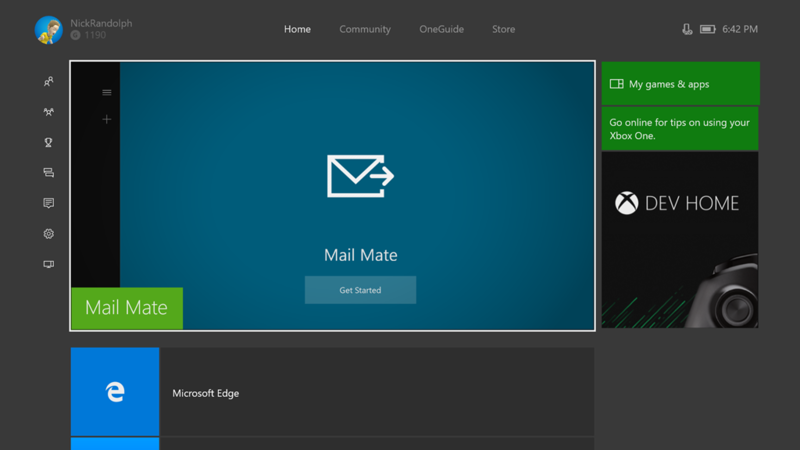 On Xbox we noticed that within a UWP application the normal double-tap of the Xbox button doesn’t seem to take a screenshot. 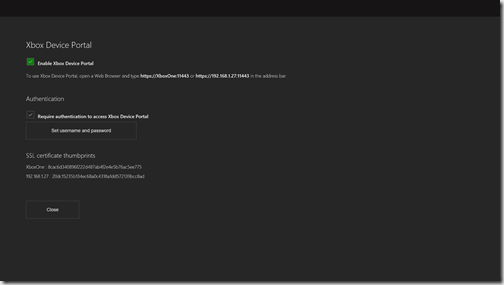 This is was confirmed by a post on the forum (https://social.msdn.microsoft.com/Forums/en-US/e100560d-a26b-48f8-a2bf-acce75ea4d26/uwpxbox-how-to-capture-screenshot-on-xbox-one-for-uwp-app?forum=wpdevelop) where the recommendation was to write code to take a screenshot. 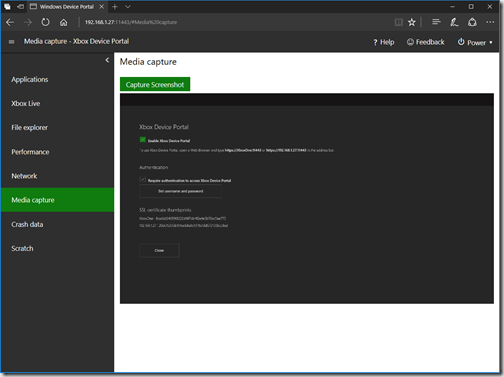 I even started down the path of using similar code to extract a screenshot, when I remembered there was a developer portal that’s exposed when you switch the device into dev mode (see https://docs.microsoft.com/en-us/windows/uwp/xbox-apps/devkit-activation). I figured that once I took a screenshot using code, I’d need a way to get the image off the console, and that the developer portal was the way to do this. The first thing to do is to go to Dev Home – there should be a link on the right of the home screen when your console is in developer mode. If you don’t see it but you’ve setup dev mode, it may be that your device has reverted to retail mode, in which case you’ll need to run the dev mode activation app again. Once enabled you’ll need to configure authorisation by specifying username and password – write these down as you’ll need them shortly to access the dev portal. The next step is to go to a computer that’s on the same network as the Xbox (or at least a network that can reach the Xbox). Enter the IP address with the corresponding port number (see previous screenshot which is shown after enabling device portal, which shows the IP address and port number of your console). 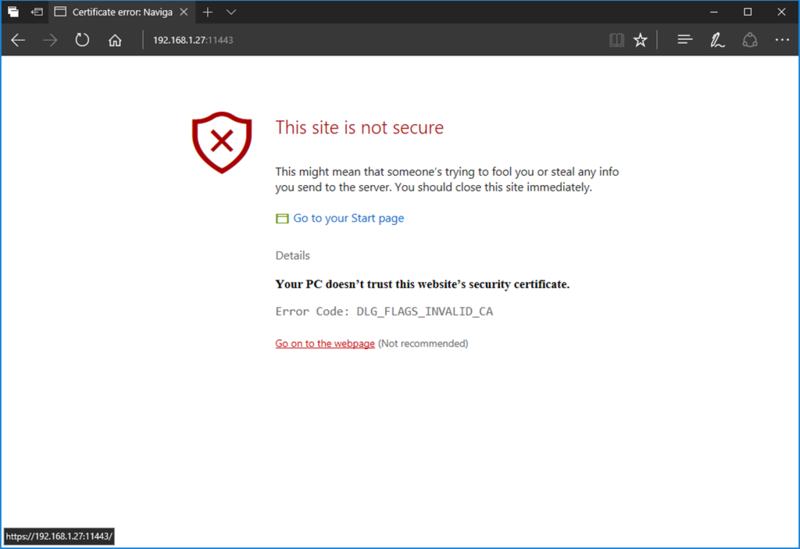 In most browser (this was Edge, but similar behaviour happens on most modern browsers) you’ll see a warning that the site you’re attempting to access can’t be verified. You need to expand, in this case, Details in order to see a link that will allow you to continue on to the device portal. 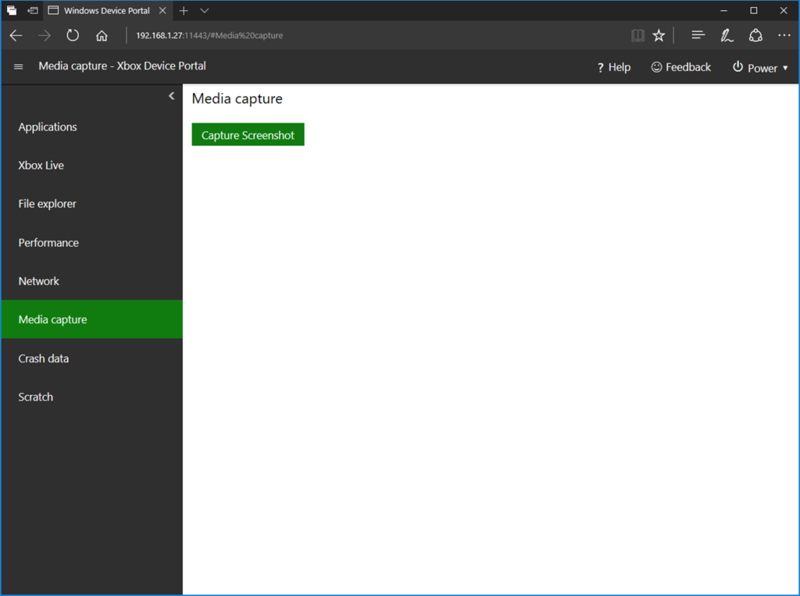 Now that you’re in the device portal, select the Media capture node on the left. Click the “Capture Screenshot” at any point to screenshot whatever’s currently being displayed on the Xbox. You’ll also be prompted to open or save the captured image. Which looks so much cleaner. Unfortunately this has actually just made my code even worse – I still have this horrible nasty string literal, now with embedded code. Argh, who does this stuff. Next step, factor the string out into a constants, or ideally configuration file. I’m sure there are a ton of other ways to make this nicer and perhaps more readable but having a string literal with interpolation is not one of them. 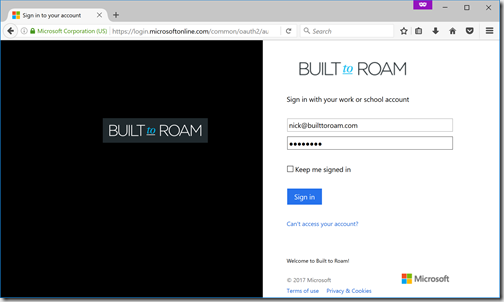 In my post, Authorizing Access to Resources using Azure Active Directory, I talk about authenticating using the built in browser on the device, rather than authenticating via a webview, which is all too common. 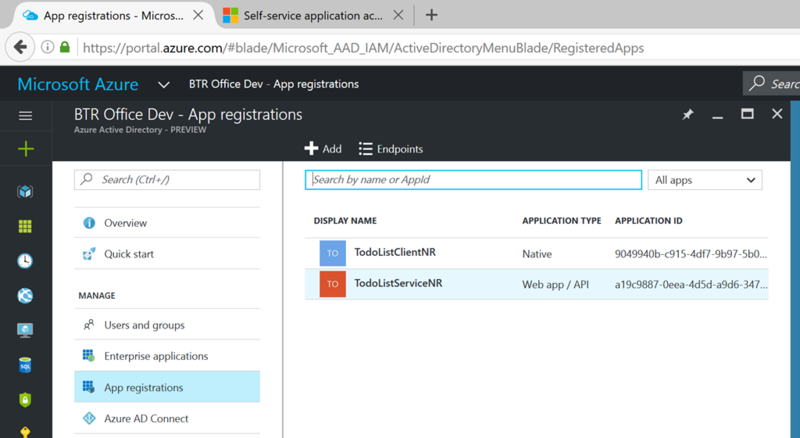 Unfortunately despite being fully supported by Azure Active Directory, the team responsible for ADAL haven’t, as far as I can tell, provided support for using an external browser to authenticate. 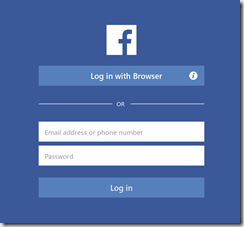 I was super impressed when I just downloaded the Facebook app on Windows, that it supports “Log in with Browser”. 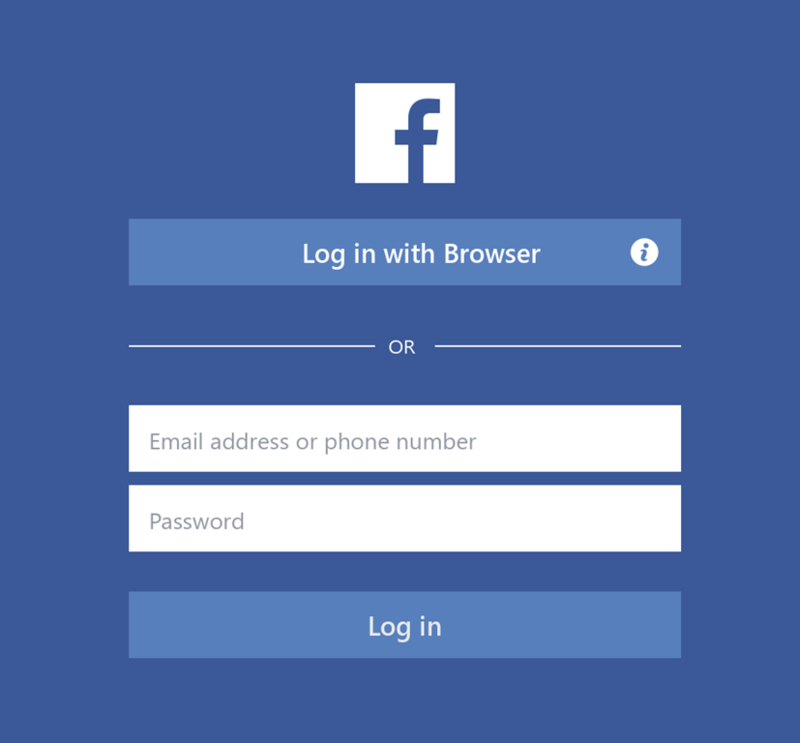 In my opinion, this not only represents a more secure form of authentication (since I can validate the website I’m signing into), it is also a better experience, since I’m already logged into Facebook in the browser anyhow. I definitely encourage developers to consider using the external browser, rather than supporting SDKs and libraries that us the in-app browser. Now I do appreciate that running prerelease software comes with some risk and I’m also aware that emulators are hard to get working 100% right on every machine. 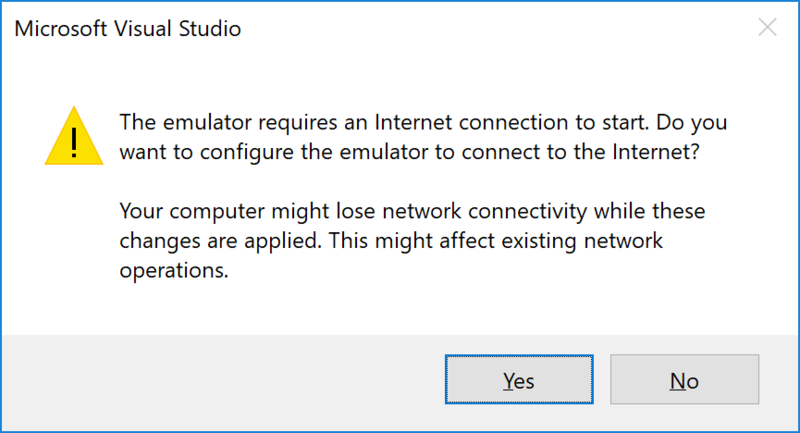 Ever since I can remember there have been connectivity issues with Windows Mobile, Windows Phone and now Windows 10 Mobile emulators; whether connectivity meaning to the internet, the local machine or being able to debug an application. 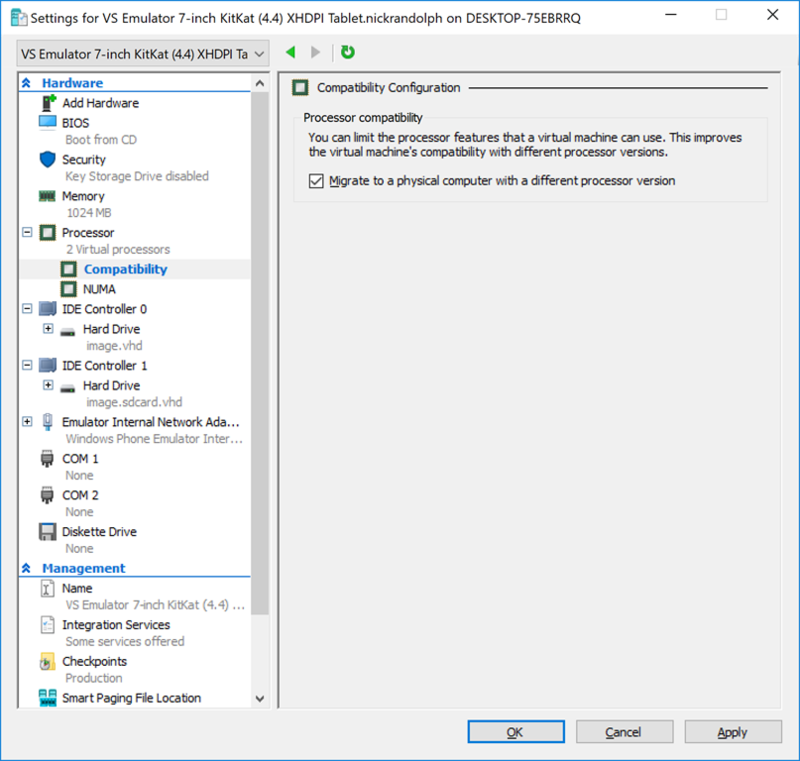 So, it came as no surprise that after rebuilding my computer and installing Visual Studio 2017 RC that my installation of the Visual Studio Android Emulator was semi-broken. Turns out I had two issues I needed to overcome. 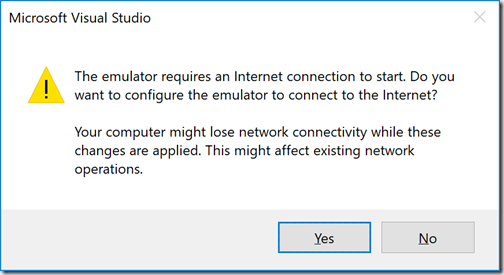 When I attempted to launch the emulator, I got the following notice, saying that the Internet Connection needs to be configured – this is pretty typical for first run as Hyper-V needs to setup the virtual switches that the emulator image will use. 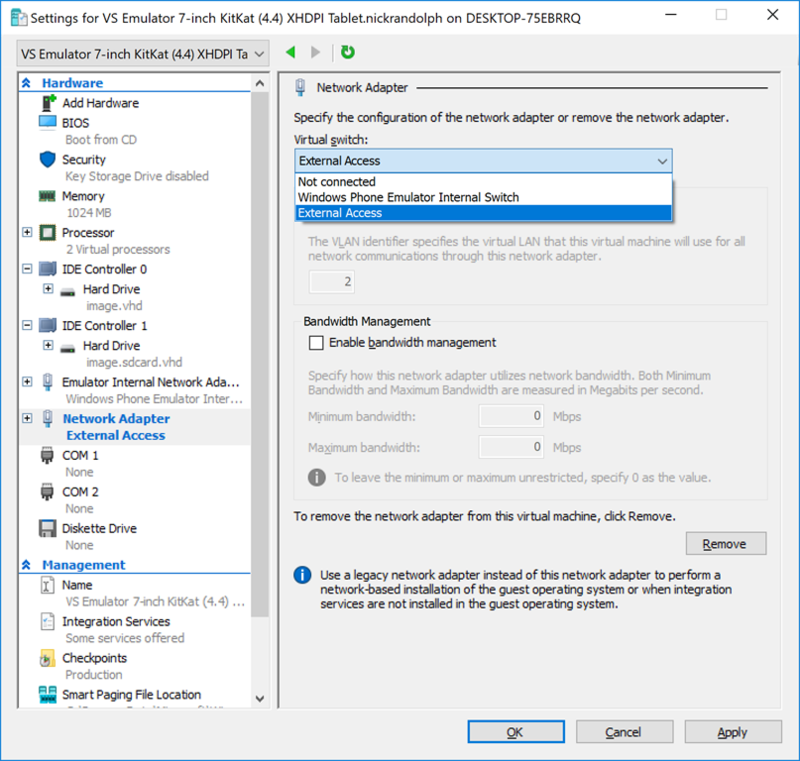 - Important: Make sure you stop and restart the Hyper-V service, otherwise, for some reason the setting is lost the next time you run the emulator. Having done this I can now deploy and run applications on the emulator. The next issue was that for some reason the emulator couldn’t access the internet. 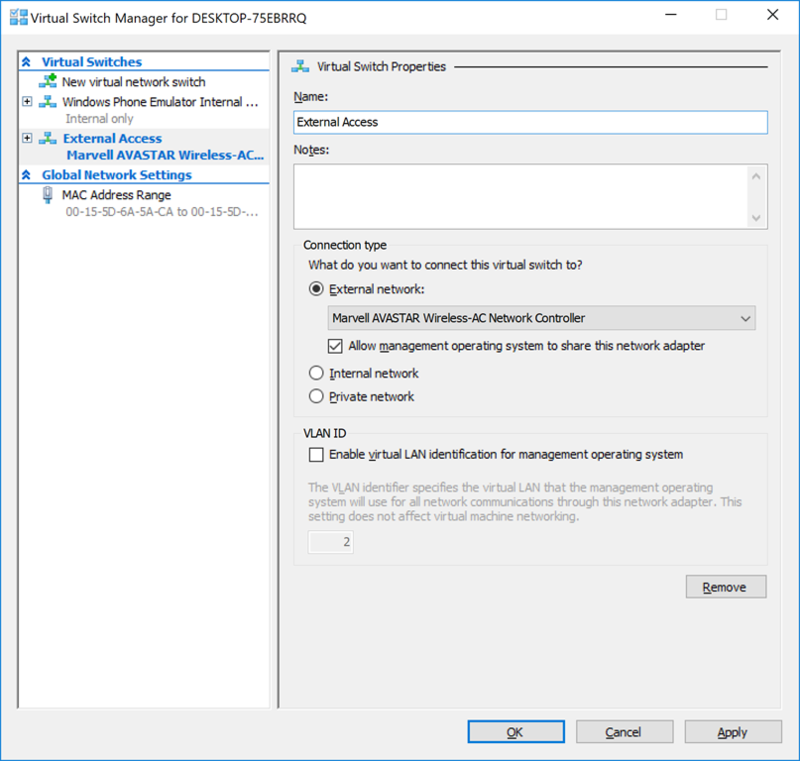 I took a look in the Virtual Switch Manager in Hyper-V Manager (click Virtual Switch Manager from the Actions list on the right side of the Hyper-V Manager management console) and there was only a single “Windows Phone Emulator Internal” switch. 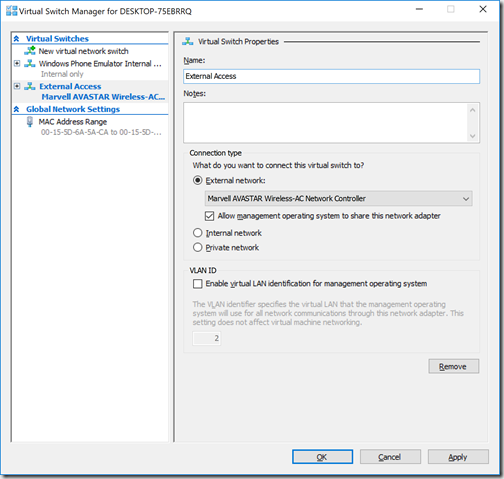 Each emulator virtual machine needs to have access to both the internal and external switches, so after clicking OK to exit the Virtual Switch Manager, I clicked on the virtual machine that I want to assign the new virtual switch to. 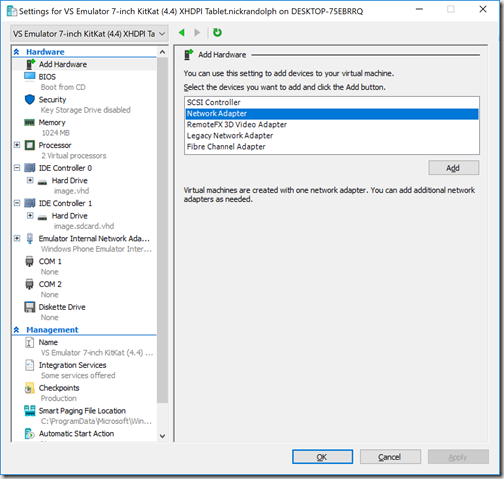 Make sure you’ve stopped the virtual machine (closing the Android emulator will do this). 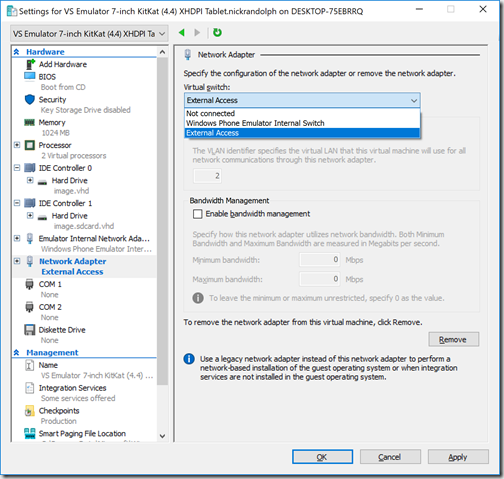 Click Settings, click Add Hardware and select Network Adapter and click Add. 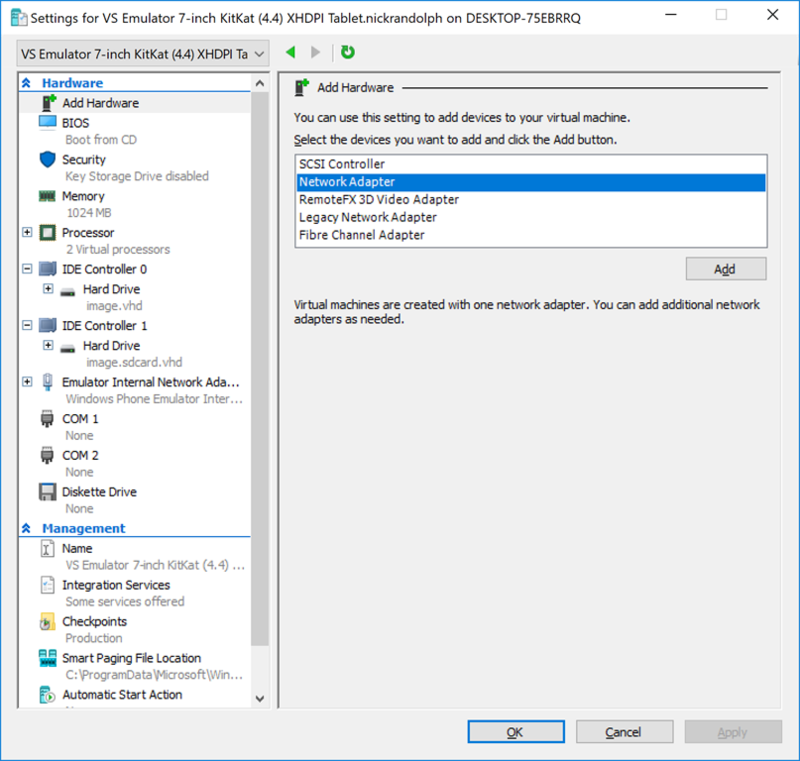 From the Virtual switch dropdown, select the virtual switch you just created (External Access in my case), and click OK.
Now launch the emulator (either via the Visual Studio Android Emulator interface that can be launched from the Start menu independently of Visual Studio, or by attempting to run an application from Visual Studio) and you should now have internet access – check via the web browser in the emulator if you’re in any doubt. 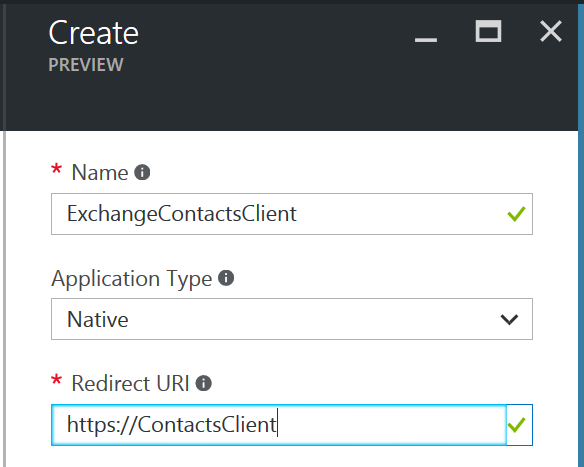 In my previous post, Securing a Web API using Azure Active Directory and OWIN, I covered how to authorize requests against Azure Active Directory using the UseWindowsAzureActiveDirectoryBearerAuthentication extension method in the OWN startup class. 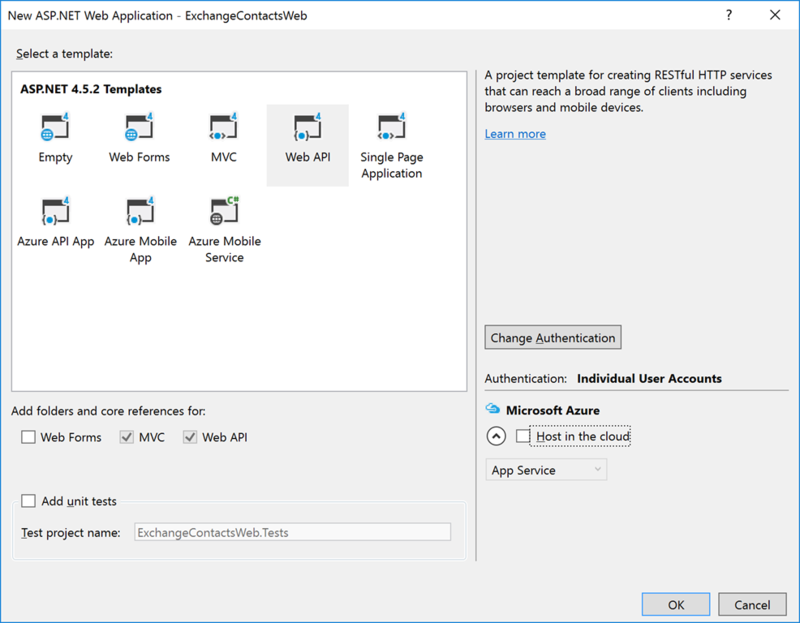 This extension method has been designed specifically for Azure Active Directory but if you think about it, the Authorization token is just a JWT token, so in theory you could take a much more generic approach to authorizing access by validating the JWT. This can be done using the UseJwtBearerAuthentication extension method. 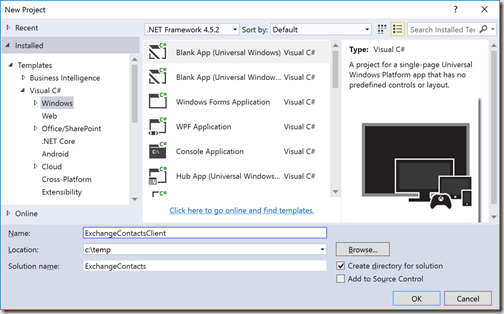 There are a couple of steps to using the UseJwtBearerAuthentication extension method. Firstly, in order to validate the signature of the JWT, we’re going to need the public certificate that matches the key identifier contained in the JWT. 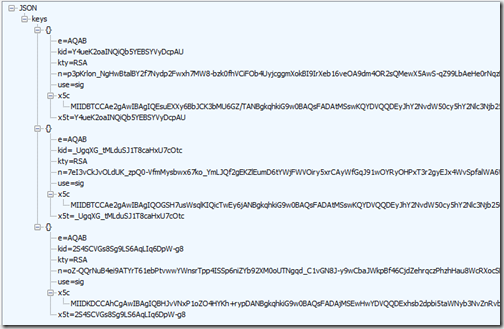 In my post on Verifying Azure Active Directory JWT Tokens I cover how to examine the JWT using https://jwt.io in order to retrieve the kid, retrieve the openid configuration, locate the jwks uri, retrieve the keys and save out the key as a certificate. In the post I used the certificate (ie wrapping the raw key in ---BEGIN---, ---END--- markers) to validate the JWT; in this case I’ve copied the contents into a text file which I’ve named azure.cer and added it to the root of my web project (making sure the build action is set to Content so it is deployed with the website). 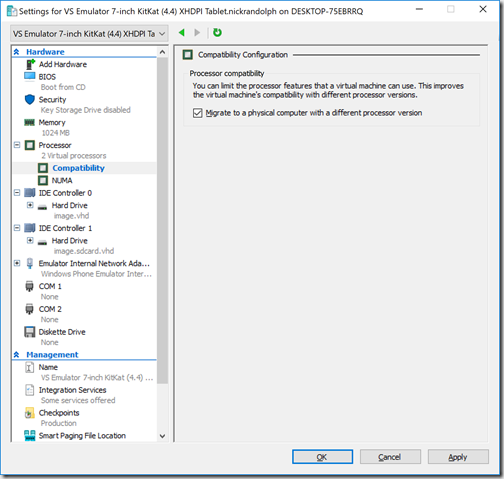 The next thing to do is to remove the UseWindowsAzureActiveDirectoryBearerAuthentication extension method, replacing it with the following code. 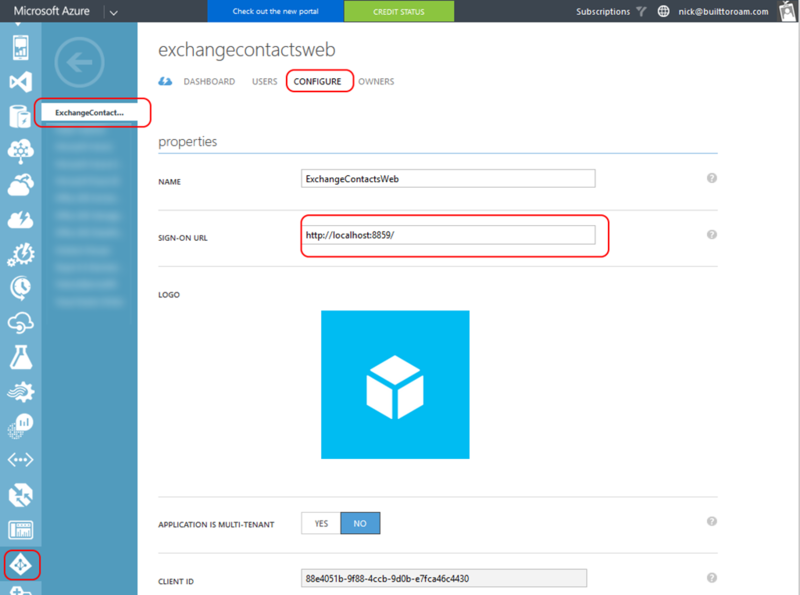 This code uses the azure.cer certificate file combined with the Audience and IssuerName which I’ve added to the web.config. 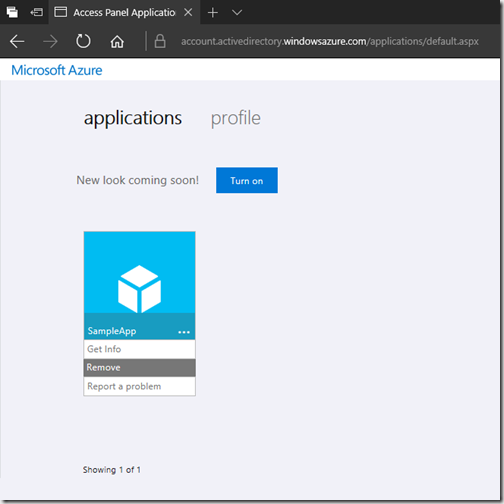 The Audience is the application id (aka client id) of the Azure application registration. 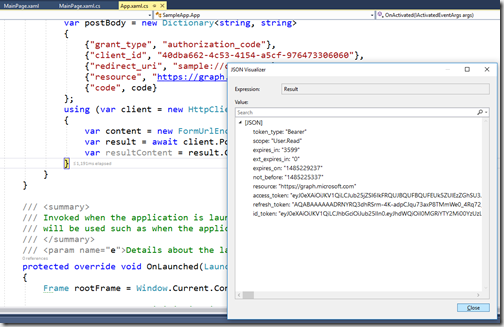 The IssuerName needs to match to what appears in the JWT. Opening one of the tokens in https://jwt.io it’s the ISS value that you want to use as the IssuerName. Now you can run the project and see that again the requests are validated to ensure they’re correctly signed. 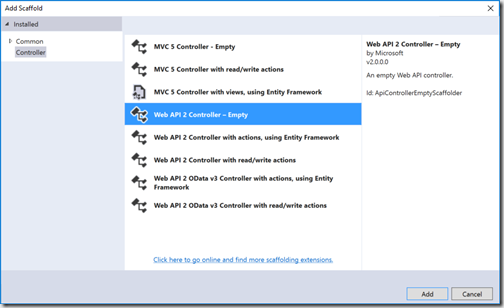 In this post we’re going to look at how to use Azure Active Directory to secure a web api built using ASP.NET (full framework – we’ll come back to .NET Core in a future post). 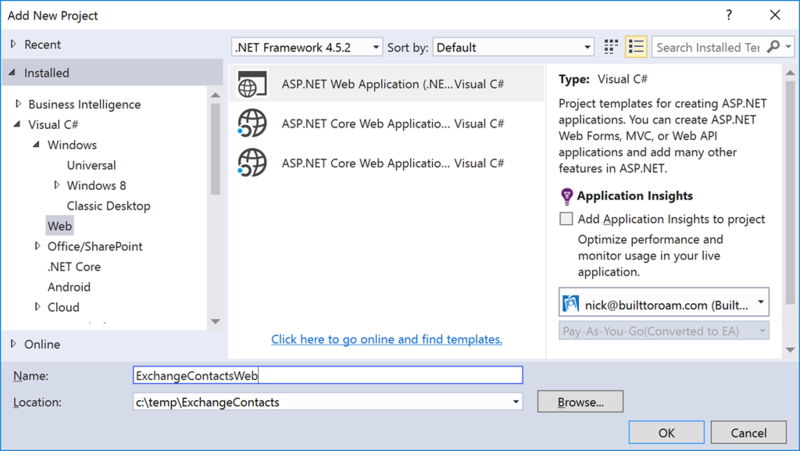 To get started I’m going to create a very vanilla web project using Visual Studio 2017. 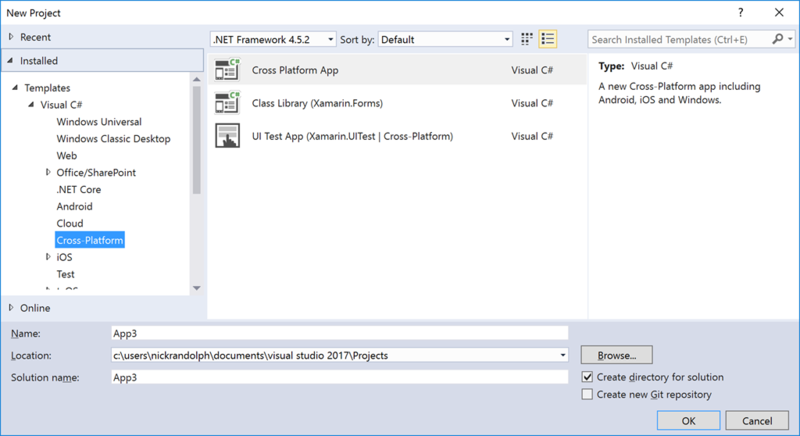 At this point VS2017 is still in RC and so you’ll get slightly different behaviour than what you’ll get using the Visual Studio 2015 templates. 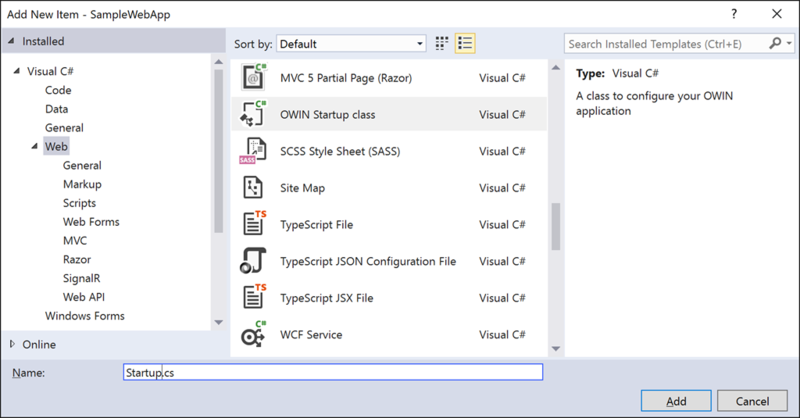 In actual fact the VS2015 templates seem to provide more in the way of out of the box support for OWIN. 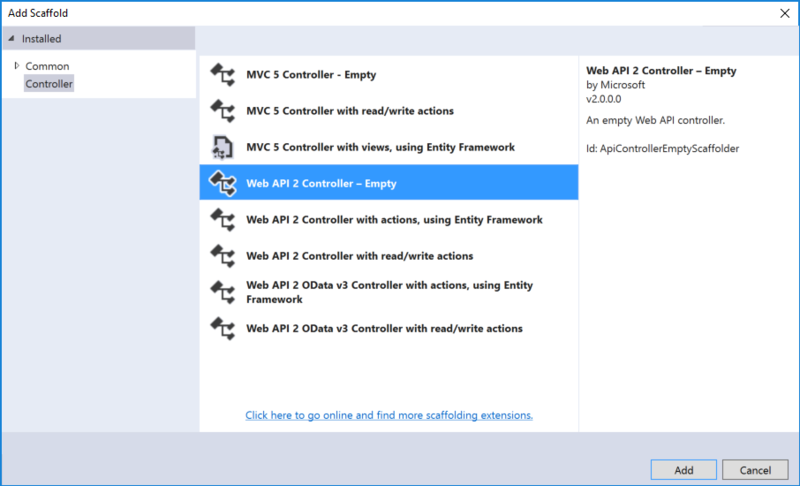 I ran into issues recently when I hadn’t realised what VS2015 was adding for me behind the scenes, so in this post I’ll endeavour not to assume anything or skip any steps along the way. After creating the project, the first thing I always to is to run it and make sure the project has been correctly created from the template. In the case of a web application, I also take note of the startup url, in this case http://localhost:39063/. However, at this point I also realised that I should do the rest of this post following some semblance of best practice and do everything over SSL. 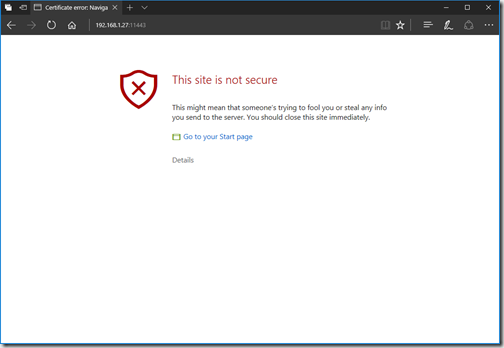 Luckily, recent enhancements to IIS Express makes it simple to configure and support SSL with minimal fuss. 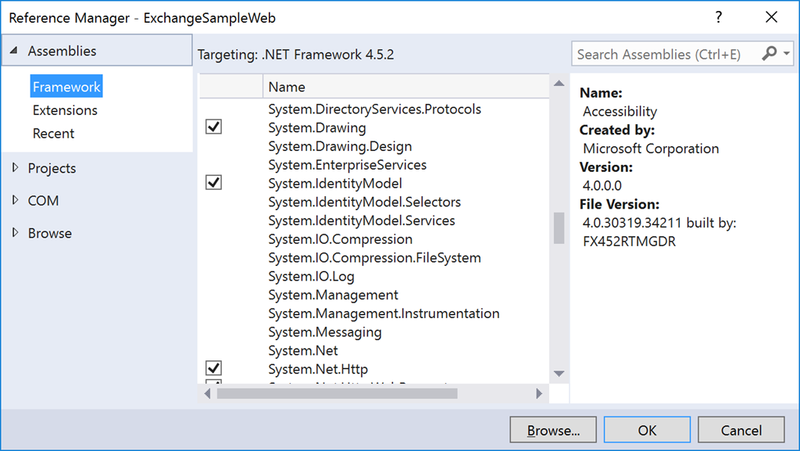 In fact, all you need to do is select the web project node and press F4 (note, going to Properties in the shortcut menu brings up the main project properties pane, which is not what you’re after) to bring up the Properties window. At the bottom of the list of properties is the SSL Enabled and SSL URL, which is https://localhost:44331/. Take note of this url as we’ll need it in a minute. 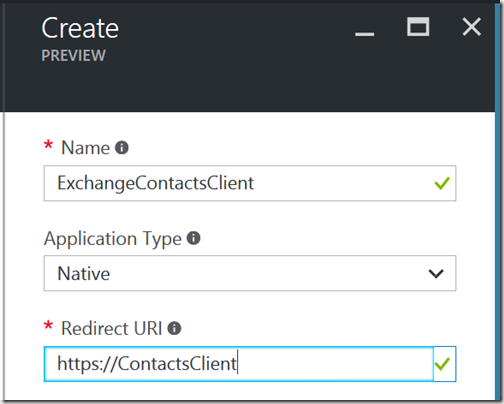 To setup the Web API in order to authorize requests, I’m going to create a new application registration in Azure Active Directory. 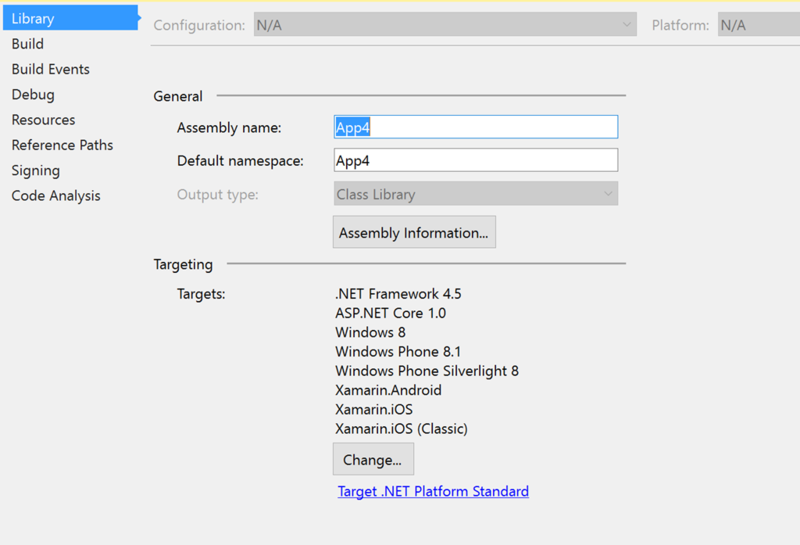 This time I need to select Web app / API from the Application Type dropdown. 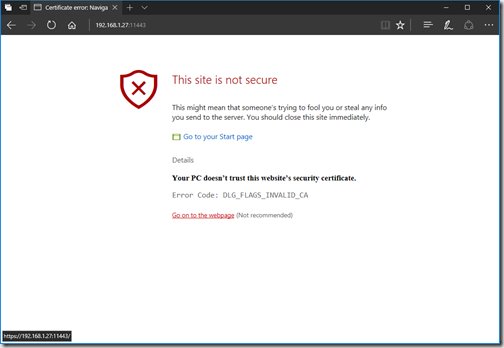 I’ll give it a Name (that will be shown in the Azure portal and when signing into use this resource) and I’ll enter the SSL address as the Sign-on URL. This URL will also be listed as one of the redirect URIs used during the sign in process. During debugging you can opt to do this over HTTP but I would discourage this as it’s no longer required. After creating the application, take note of the Application Id of the newly created application. 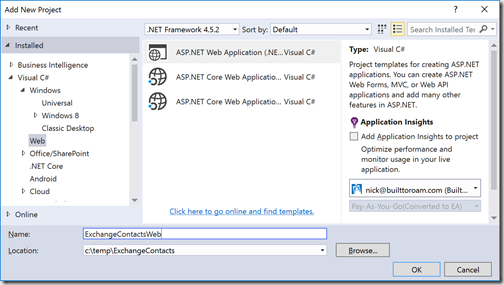 This is often referred to as the client id and will be used when authenticating a user for access to the web api. We’re done for the moment with Azure Active Directory, let’s turn to the web application we recently created. The authorization process for in-bound requests involves extracting the Authorization header and processing the bearer token to determine if the calling party should have access to the services. 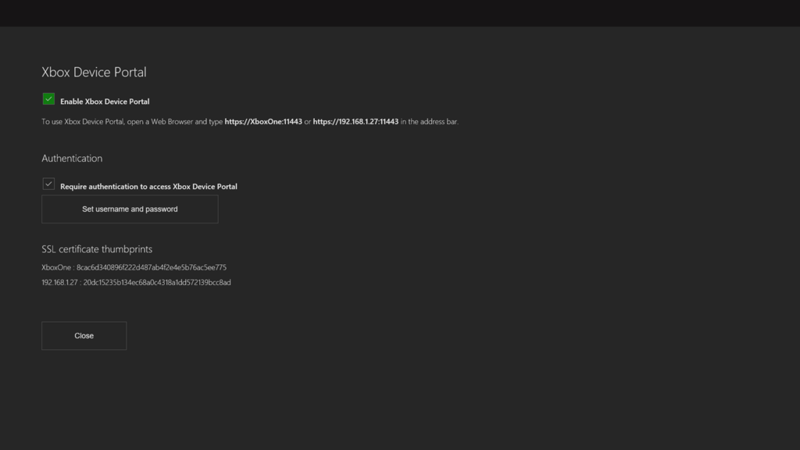 In order to do this for tokens issues by Azure AD I’ll add references to both the Microsoft.Own.Security.ActiveDirectory and Microsoft.Own.Host.SystemWeb packages. Note: Adding these references takes a while! Make sure they’re completely finished before attempting to continue. 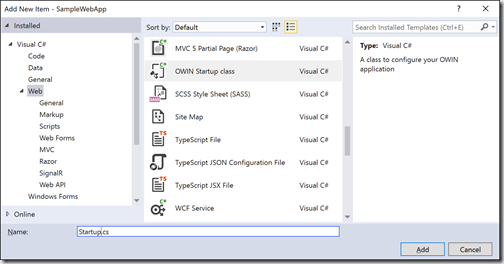 Additionally, you’ll want to add another partial class file Startup.Auth.cs in the App_Start folder. The tenant is the Id, or in this case, the domain of the tenant where the application is registered. 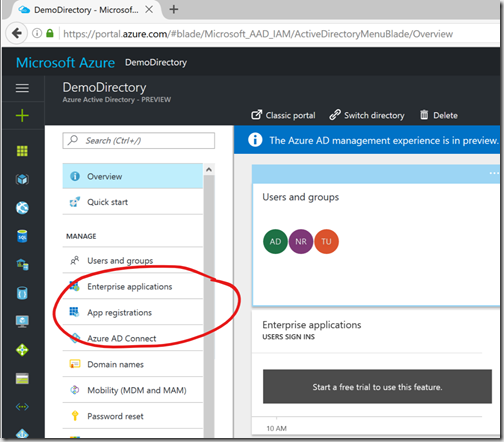 The Audience is the application Id of the application registered in Azure AD. Warning: If you run the application now and get an error relating to a missing type, you may have to revert the Microsoft.Owin.Security.ActiveDirectory to the most recent v4 package. 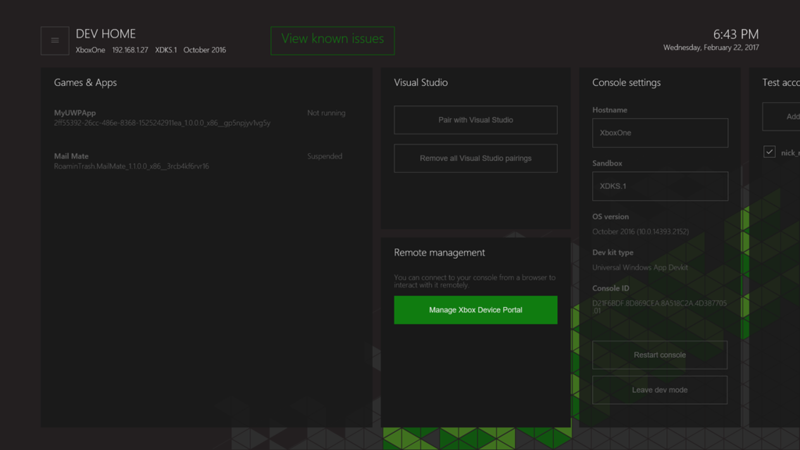 At the time of writing this post there seems to be an incompatibility between v5 and Owin. System.ArgumentException: IDX10708: 'System.IdentityModel.Tokens.JwtSecurityTokenHandler' cannot read this string: 'abcdefg’. The string needs to be in compact JSON format, which is of the form: '<Base64UrlEncodedHeader>.<Base64UrlEncodedPayload>.<OPTIONAL, Base64UrlEncodedSignature>'. As we should have predicted, the token we passed in isn’t a value Jwt – it’s not even valid JSON. 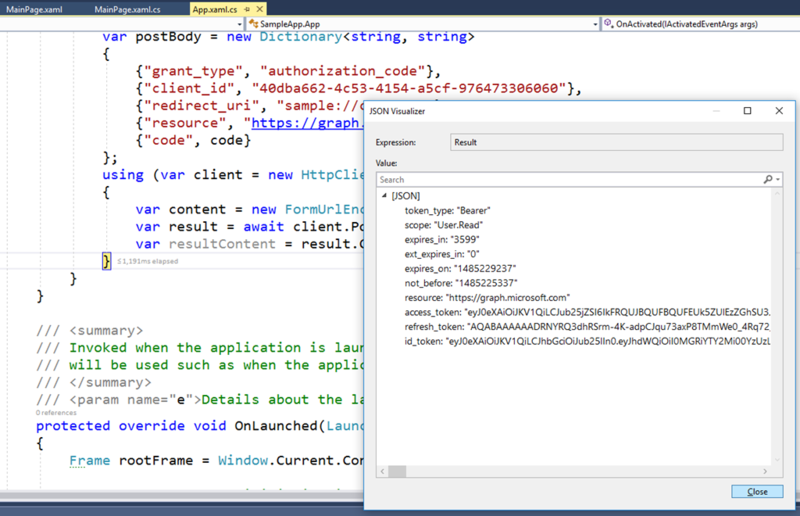 Let’s fix this by generating an actual access token for this Web API. In a previous post I walked through manually the process of authenticating, retrieving an authorization code and then exchanging it for an access token. I’ll do the same here. https://localhost:44331/ - This is the uri that the browser will be redirected back to, passing with it the code in the query string. 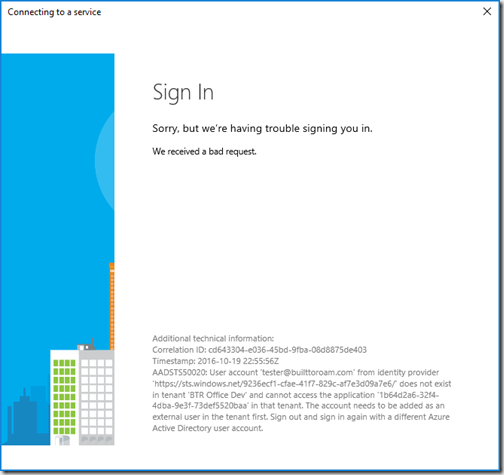 a07aa09e-21b9-4e86-b269-a18903b5fe54 – This is the application id of the application registration in Azure AD. It’s required as both the client_id and the resource, since we’re using the access token to access the web application itself. 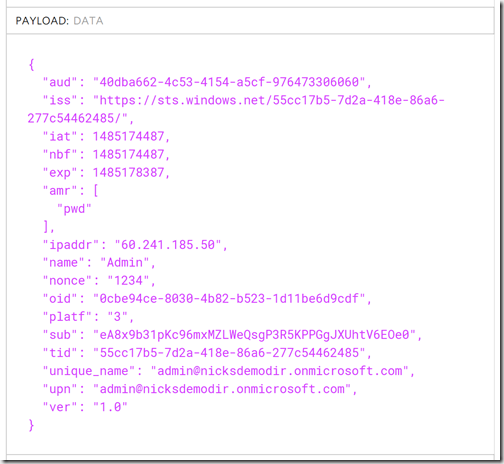 c06kP0Q9ENGpZGbiZTqB1QQaZUWNe190mCittRMr – This is a private key (aka client secret) issued by the Azure AD application to ensure the security of token requests. I’ll come back to this in a second and show how to create one for your application. 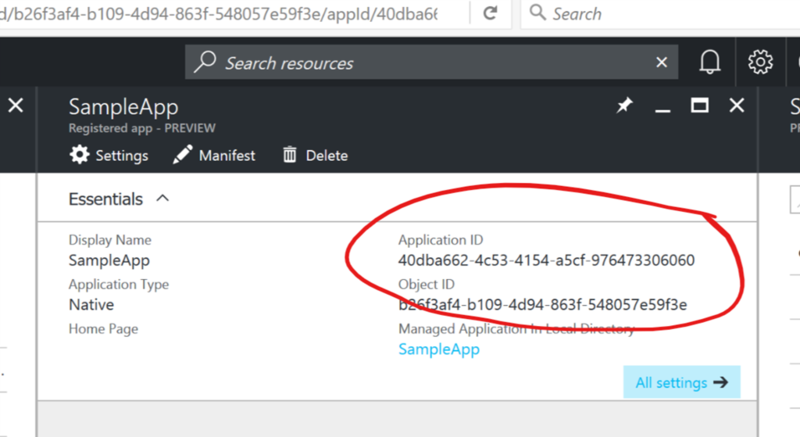 To generate the client secret in Azure AD simply click on the Keys tab within the details of the application registration. You can then create a new key by entering a description. The description is only seen by you, so give it a name that’s meaningful to you. Note that once you save the new key, you will only be shown the value of the key once. Once you leave the page, the value of the key will never been shown again. The key created in the Azure AD should be used as the client secret when doing the authorization code to access token exchange. This should give you a 200 response with data. 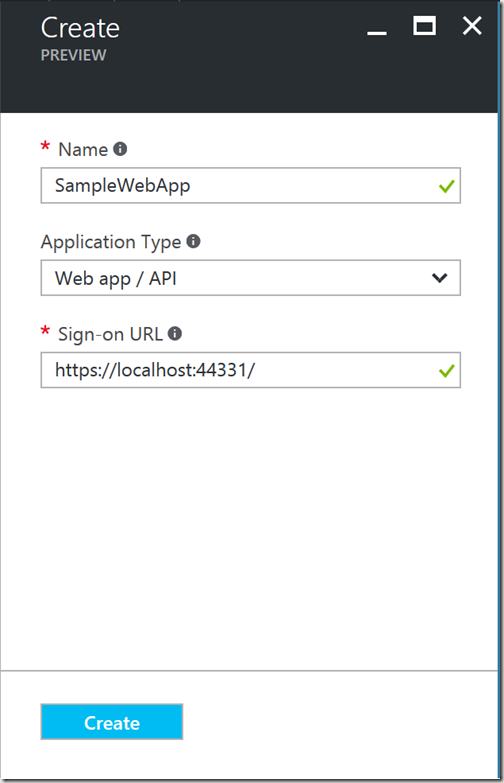 And there you have it – you’ve successfully secured your web api so that it requires the user to be authenticated using Azure Active Directory. Firstly, the use of two factor authentication (TFA) is a must requirement for anyone who is using the Azure portal – if you are an administrator of your organisation, please make sure you enforce this requirement for anyone accessing your tenant/directory/subscription. 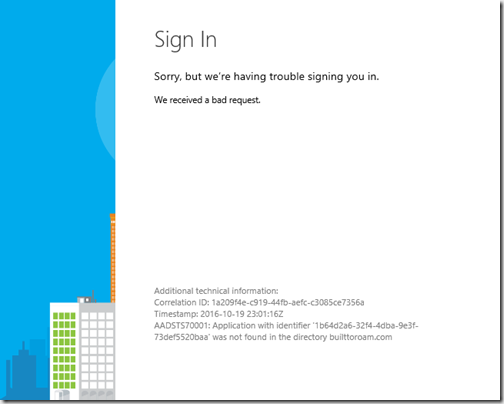 This applies to staff, contractors, guests etc who might be using your Azure portal or the Office 365 portal. 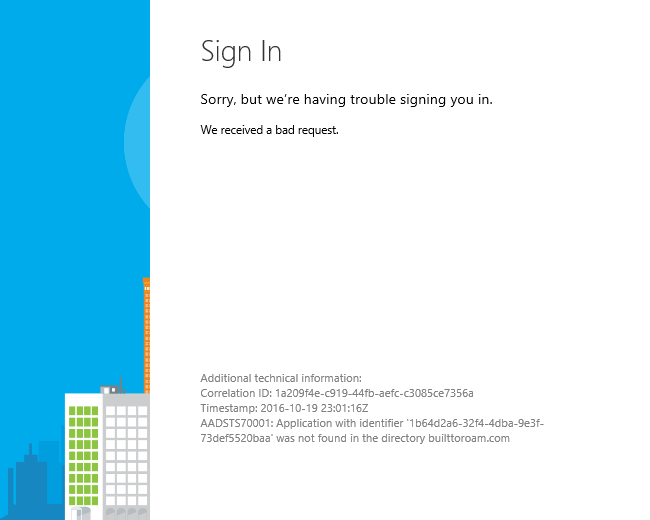 In fact, in this day in age, I would be enforcing two factor authentication for all employees – note that Outlook and Skype for Business are still stuck in the dark-ages and don’t access TFA sign in. 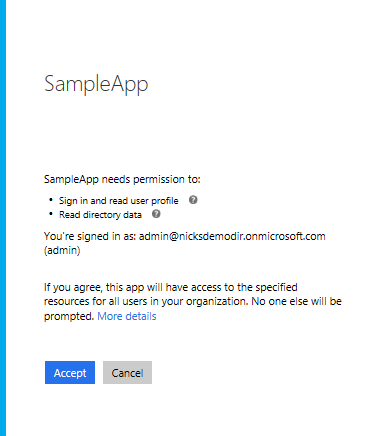 For these you’ll need to generate an application password (go to https://myapps.microsoft.com, click on your profile image in top right corner and select “Profile”, click through to “Additional security verification,” click on the “app passwords” tab and then click “Create” to generate an app password. 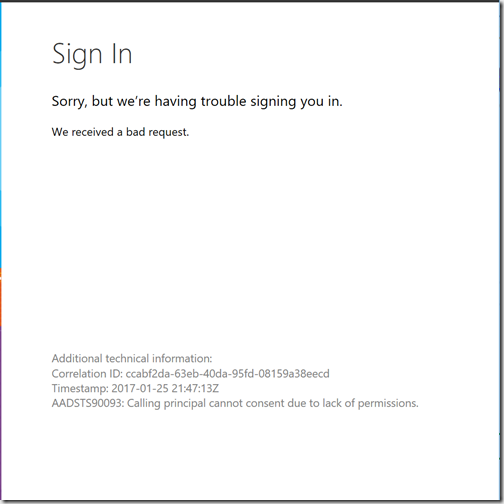 Ok, next is the use of a separate global administrator account – this is in part tied to the previous point about using TFA. If you’re a global administrator of your tenant and you enable TFA, you won’t be able to generate app passwords. This is essentially forcing you down the path of best practice, which is to have a separate account which is the global administrator for your tenant. If other people in your organisation need administrative permissions, you can do this on a user or role basis within the Azure portal – our preference is to assign permissions to a resource group but there is enough fidelity within the portal to control access at the level you desire. 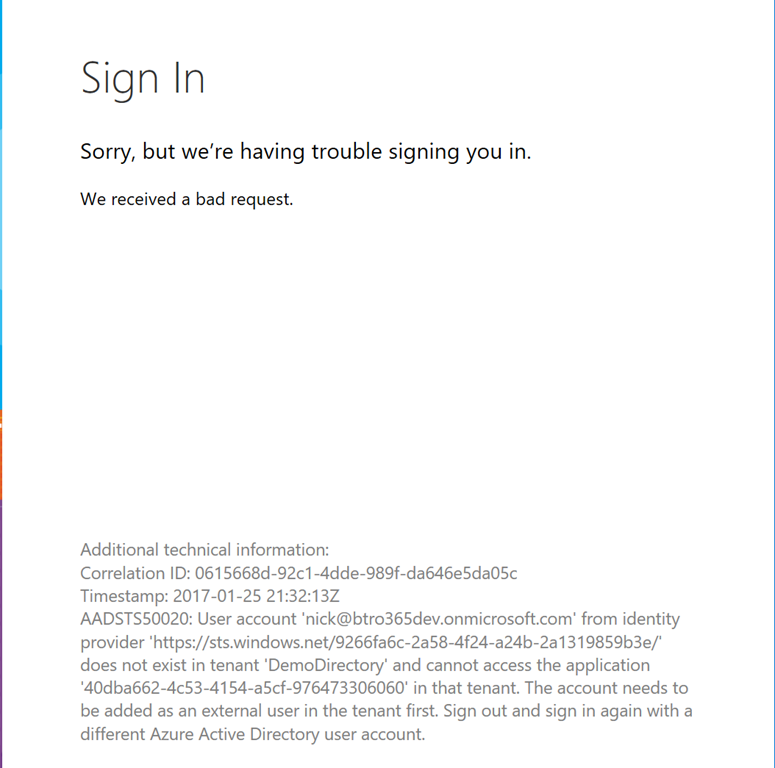 The other thing we’ve also enforced is that we do not host any Azure resources in our primary tenant (ie in our case builttoroam.com). 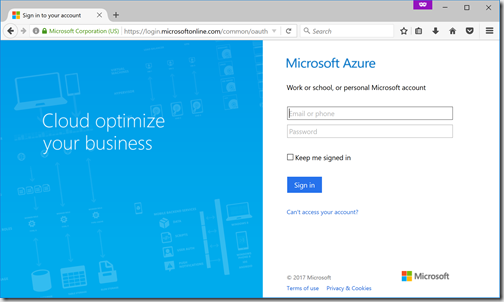 Given the importance of Office365 based services we felt it important that we isolate off any resources we create in Azure to make sure they’re completely independent of our primary tenant. The only exception to this is if we are building internal LOB applications (ie only apps for Built to Roam use) – for these we include the app registrations within the builttoroam.com tenant so that we can restrict sign in and at the same time deliver a great sign in experience for our employees. For example we’re using Facebook Workplace (https://workplace.fb.com/) – we configured this within the builttoroam.com tenant in Azure AD to allow for a SSO experience. This not only improves the perception (for internal and external users), it also gives everyone a sense of confidence that they’re signing into a legitimate Built to Roam service. After saving the changes, if you attempt to sign in, you’ll notice the new images/colours etc appear. In this case, you can see that the welcome text at the bottom of the sign in page has been changed to what I entered in the company branding tab. Unfortunately because I didn’t set the sign in page image, the default is used, so you can’t see the red (#FF0000) background I set – you can see glimpses of it if you resize the page. This can be fixed by simply uploading a transparent image. The ability to customise the sign in experience is just one way to improve the experience for you staff and customers. In my initial post talking about admin consent I added the “Read directory data” to the set of permissions that the application would request. 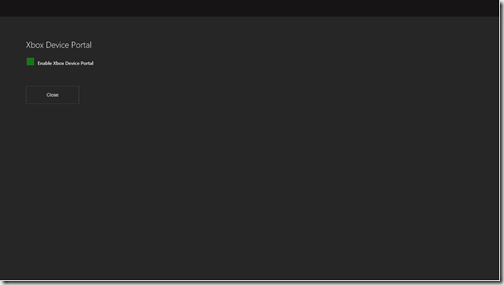 This permission, along with a number of other permissions for the Windows Azure Active Directory resource, have a green tick in the “Requires Admin” column. 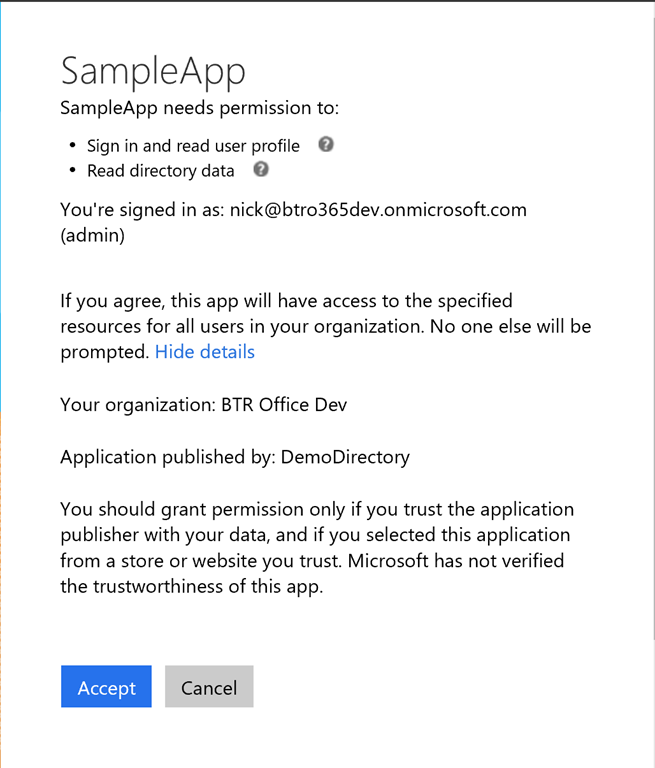 It’s all to easy for developers, when setting up the permissions for an application to not think through what enabling permissions for an application does. 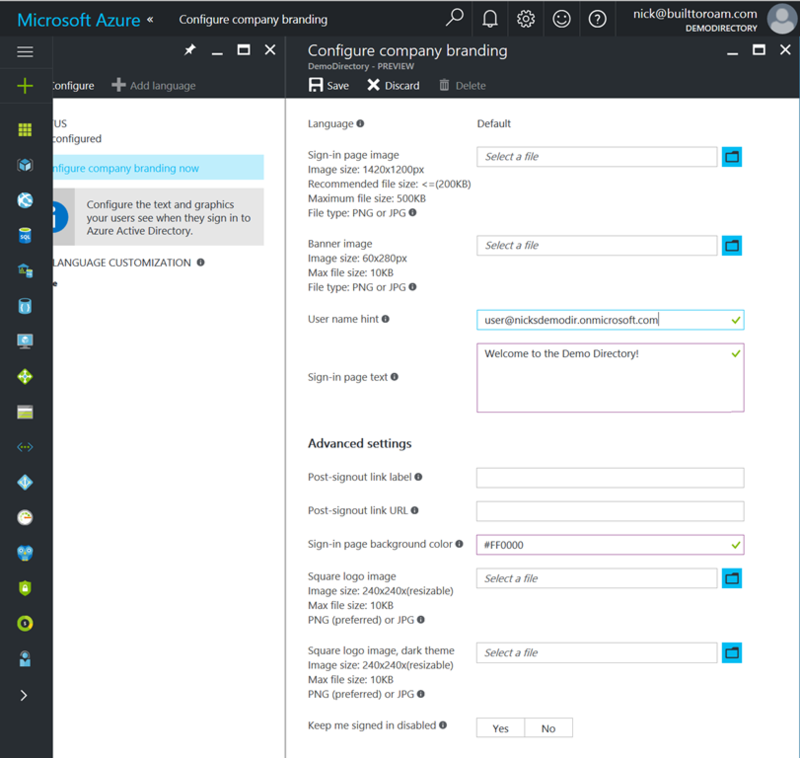 When you enable permissions for an application, by ticking the box alongside the permission in the Azure AD application configuration (see previous) image, you are essentially saying that the application will be able to perform those actions after the user has signed in and provided consent – this is true regardless of what role the user belongs to within the organisation (the application can perform the same actions whether a receptionist or the CEO of an organisation is signed in). The division between permissions that require admin consent, versus those that do not, usually are based on whether the permission is for an action that only administrators should be able to do, versus those that any user should be able to do. 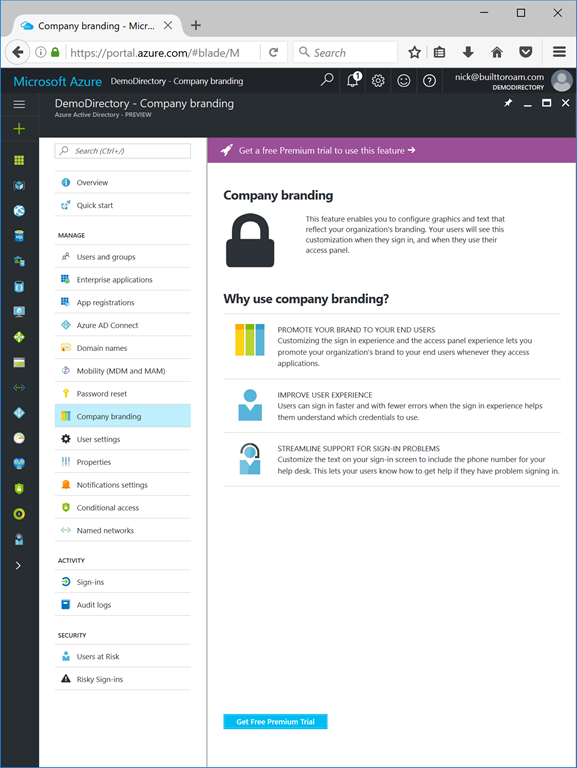 For example in the case of Windows Azure Active Directory all users should be able to sign in and read their profile, read the basic profile of all users in the directory and access the directory as the signed-in user – all of these do not require admin consent as they are either actions that pertain to the signed in user, or they are actions that all users should be able to perform. The last permission does permits more access control as elements within the directory can be secured so users/roles/groups can access them; if the user is accessing the directory as themselves, they’ll only be able to access objects that they have permissions on. In order words, once someone has signed into the application, the access token granted to the application can be used to retrieve all directory data – ummm that’s starting to sound pretty scary. No imagine if I granted “Read and write directory data” permissions to the application. Now the access token can read and write directory data. Put this into the context of hackers who use social engineering to access low level employees, you can imagine it wouldn’t be hard for them to access this application in order to access employee information. The moral of this post is DO NOT enable REQUIRES ADMIN permissions to any native application (unless you’re 100% sure you know what the implications are) – it’s way to easy to intercept access tokens and act on behalf of the user. 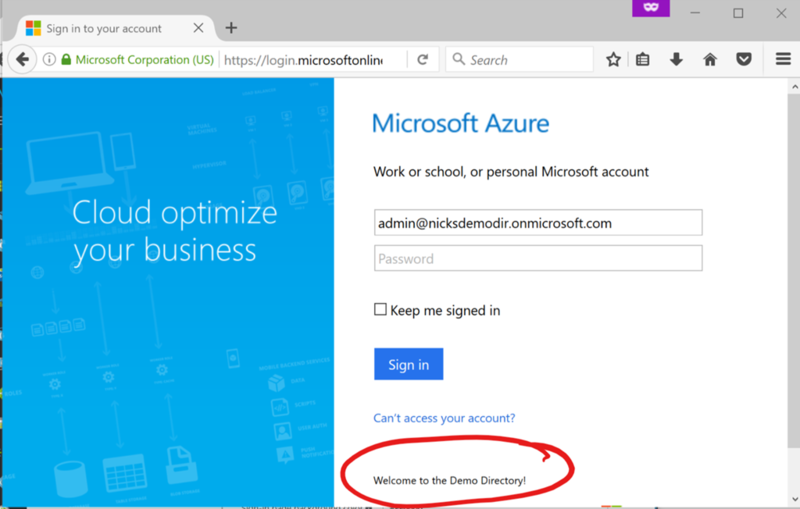 So far in my previous posts I’ve discussed signing into an application using Azure Active Directory (Azure AD) using a basic application registration in Azure AD. Last post we added some additional permissions that required administrator consent. 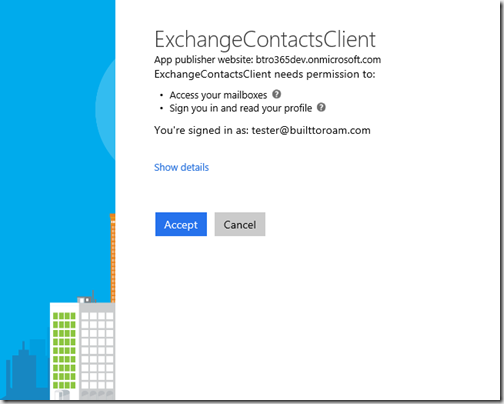 However, up until now, only users in the same directory (aka tenant) that the application is registered in, can sign in. 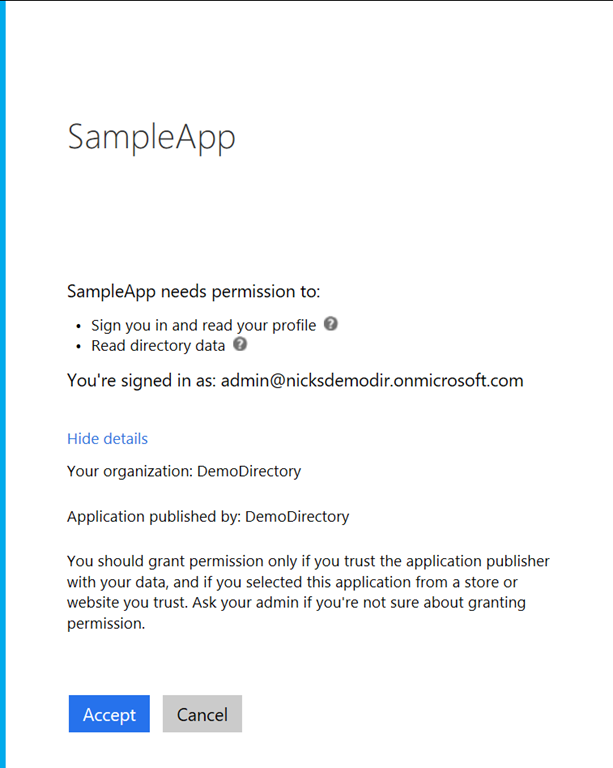 In the case of the sample application I’ve been working with, the application is registered to the nicksdemodir.onmicrosoft.com tenant, so only users belonging to that tenant can sign in eg [email protected]. 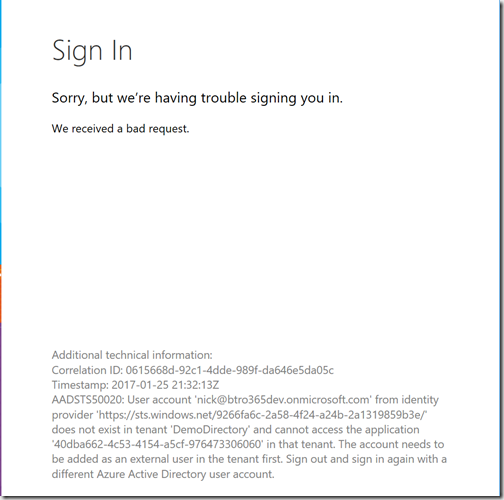 If I attempt to sign in with an account from a different tenant, I run into a few issues, and depending on what type of account I sign in with, the error that is displayed varies. This is actually less cryptic than it seems – essentially it’s saying that I’m attempting to present a token that the API can’t process. 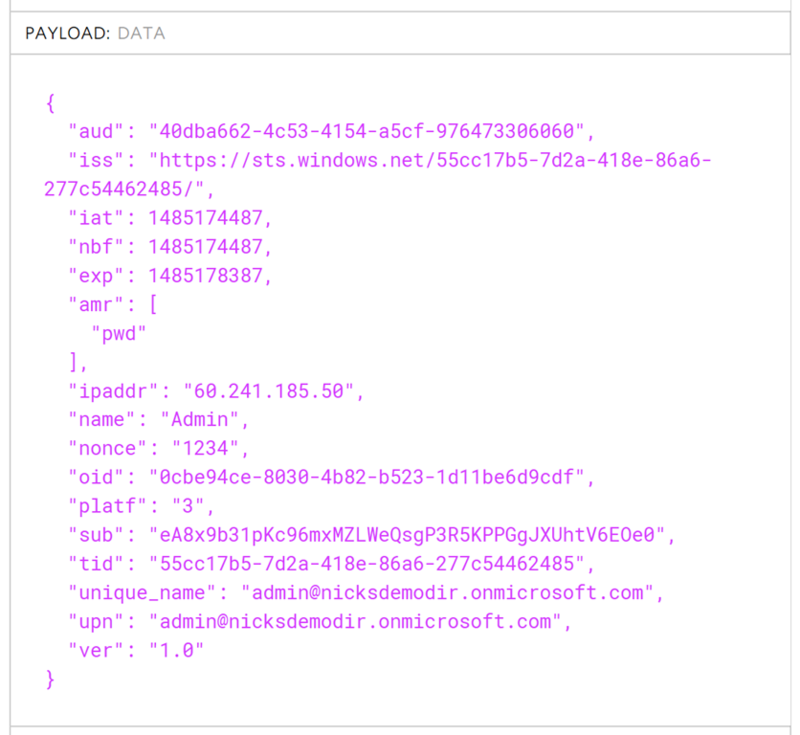 If you were to open the access token in https://jwt.io, you’d see that the token has been issued by the nicksdemodir.onmicrosoft.com tenant (actually you’d see the STS url that correlates to this tenant) for an account that doesn’t exist in that tenant (eg [email protected]). Whilst this is a legitimate access token, when you present it to the Graph API, it attempts to retrieve information about the user in the issuing tenant, which of course fails, since the user doesn’t exist there. Ok, let’s see what happens if I attempt to launch the admin consent prompt. 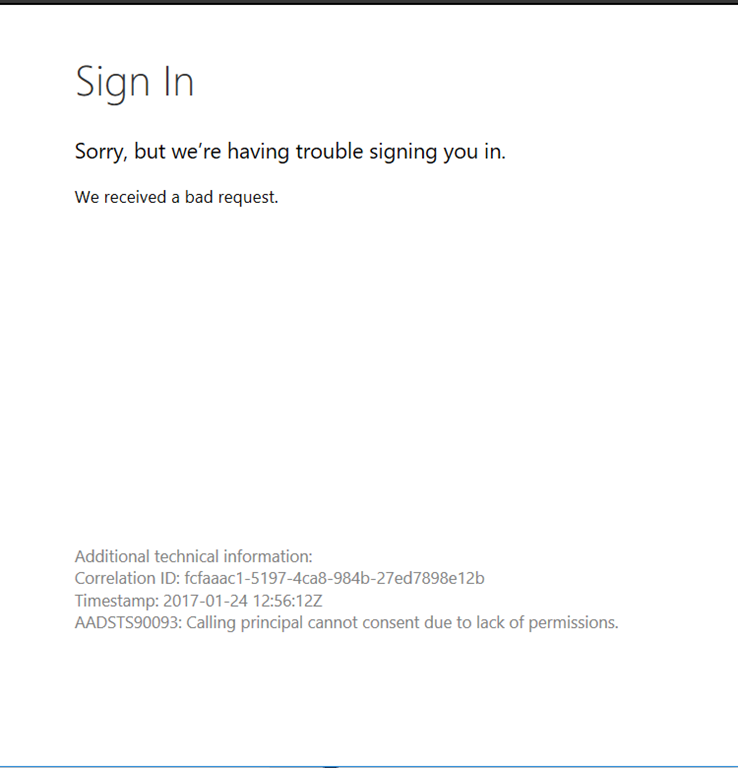 In this case, after I sign in (now using [email protected] which is a global administrator) I get a more useful error message saying “AADSTS50020: User account … does not exist in tenant”. 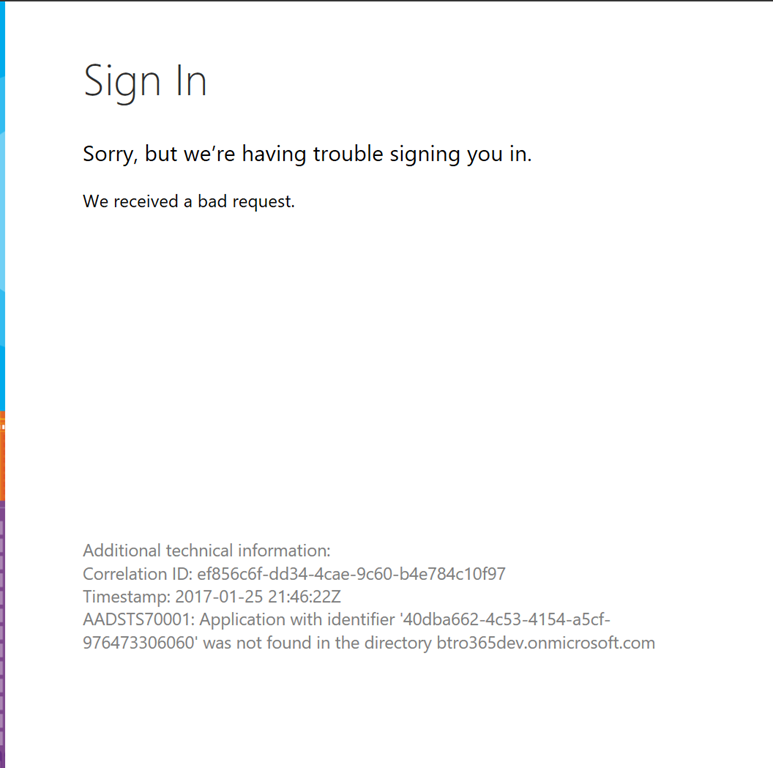 The reason this error message is useful is that it prompts me to think about what I’m attempting to do – I’ve been prompting the user to sign into the nicksdemodir.onmicrosoft.com tenant, which is fine if I’m a user that belongs to that tenant but since I’m attempting to use a different user, this is clearly not correct. So, the first step in making my application multi-tenanted is to change the authorization url that I’m directing the user to in order to sign in, to one that is more generic and will allow signing in by users from any tenant. 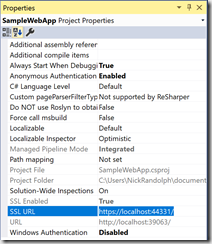 This involves exchanging the “nicksdemodir.onmicrosoft.com” with “common” in the url – the following code shows how I adapted the code in my sample application to support urls that are single tenanted (ie AuthorizationUrl and AdminConsentUrl) as well as the multi-tenanted equivalent (ie MultiTenantAuthorizationUrl and MultiTenantAdminConsentUrl). 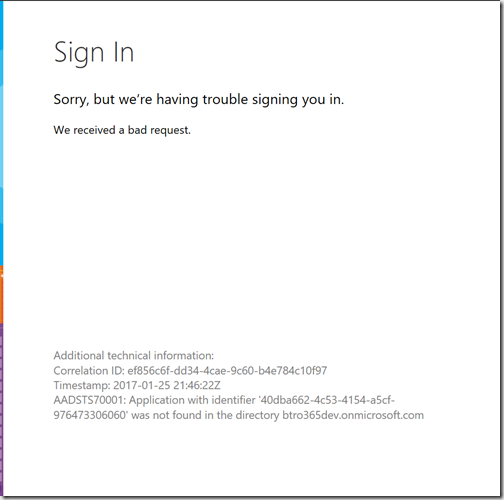 This error seems to be correct, considering the application registration exists in the nicksdemodir.onmicrosoft.com tenant. 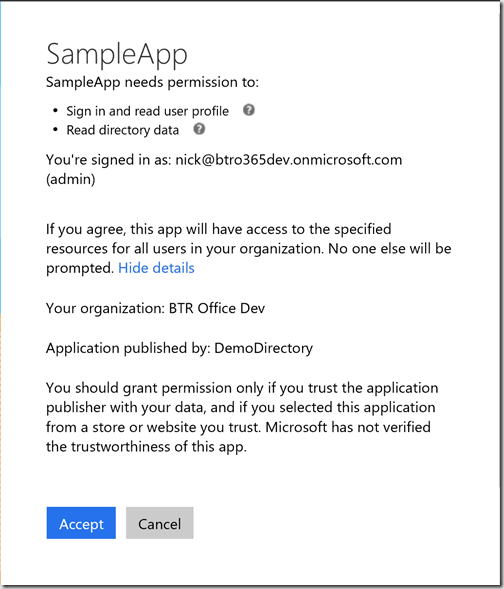 Unfortunately it’s not very clear what you need to do in order to fix this issue – you can’t add the application to the btro365dev.onmicrosoft.com tenant, and even if you could, you wouldn’t want to have to manually do that for every tenant that you want to support. 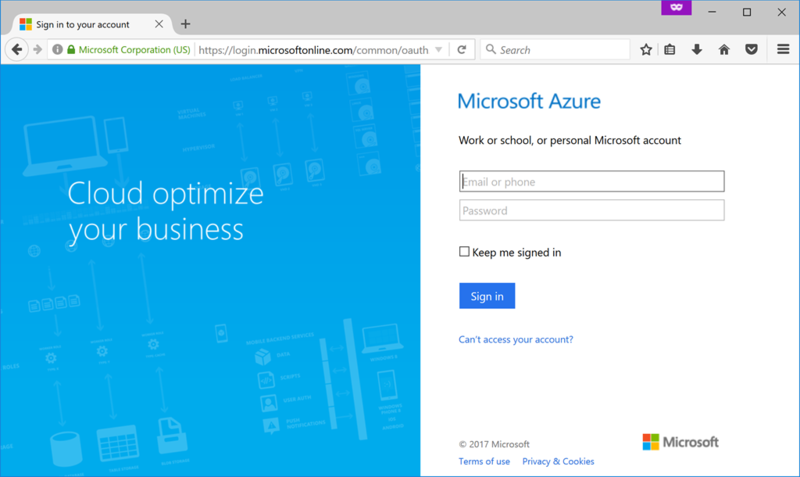 Luckily, there is a mechanism that allows Azure AD to essentially add the application to new tenants on an as required basis (similar to how applications are added to a users list of applications at https://myapps.microsoft.com as they consent to use of the application). In order for Azure AD to do this, the application registration has to be configured to support multiple tenants. 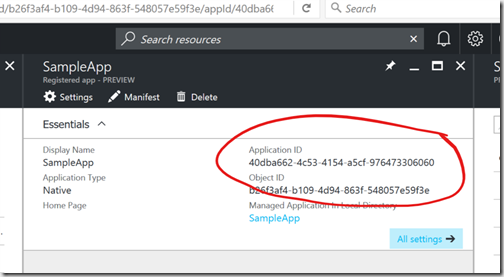 Click on the Manifest button for the application registration in Azure AD – the property “availableToOtherTenants” should be set to true (default is false). 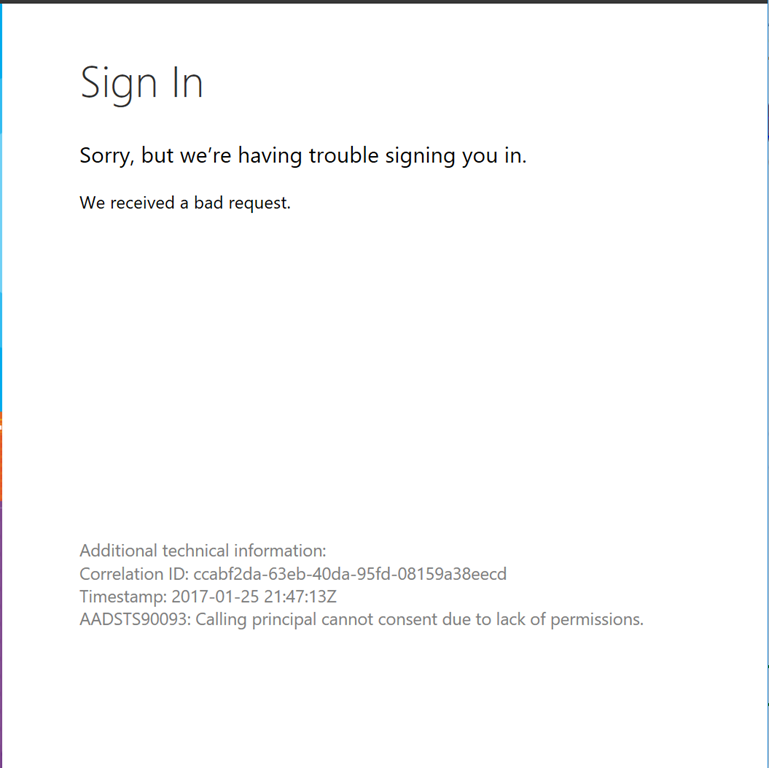 Now when we attempt to sign in (again with a non-global administrator user) we see a familiar error saying that the calling principal (ie the signed in user) doesn’t have permissions. 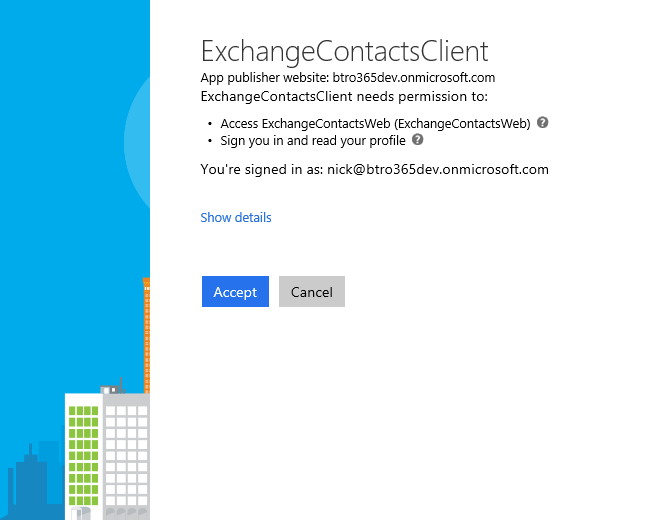 The global administrator, after signing in, will again see the admin consent prompt – it’s worth pointing out here that it lists both the directory the user is signed into (ie BTR Office Dev – btro365dev.onmicrosoft.com) and the tenant that the application is published (ie registered) in (ie DemoDirectory – nicksdemodir.onmicrosoft.com). 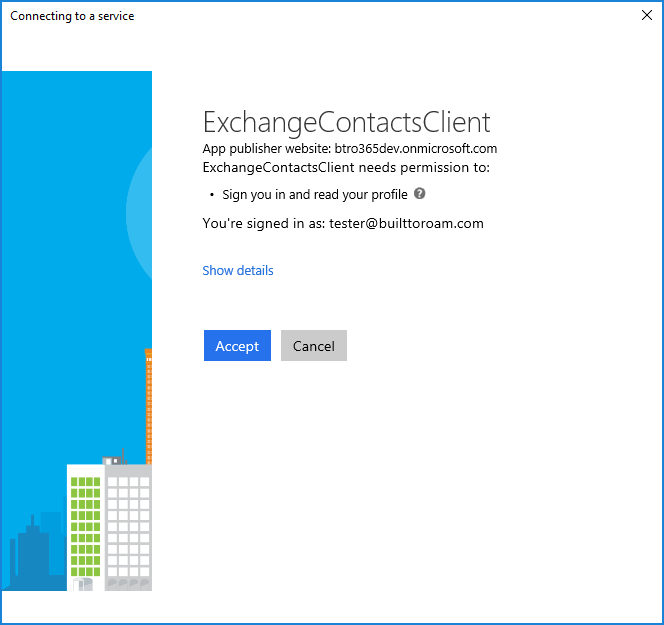 Again, consenting will enable all users in the foreign tenant (ie btro365dev.onmicrosoft.com) to then access the application via the multi-tenant authorization url. There is one last adjustment that has to be made, and that’s to the Token url. When exchanging the code for an access token, it’s important that the token url is also adjusted to be either single or multi-tenant. 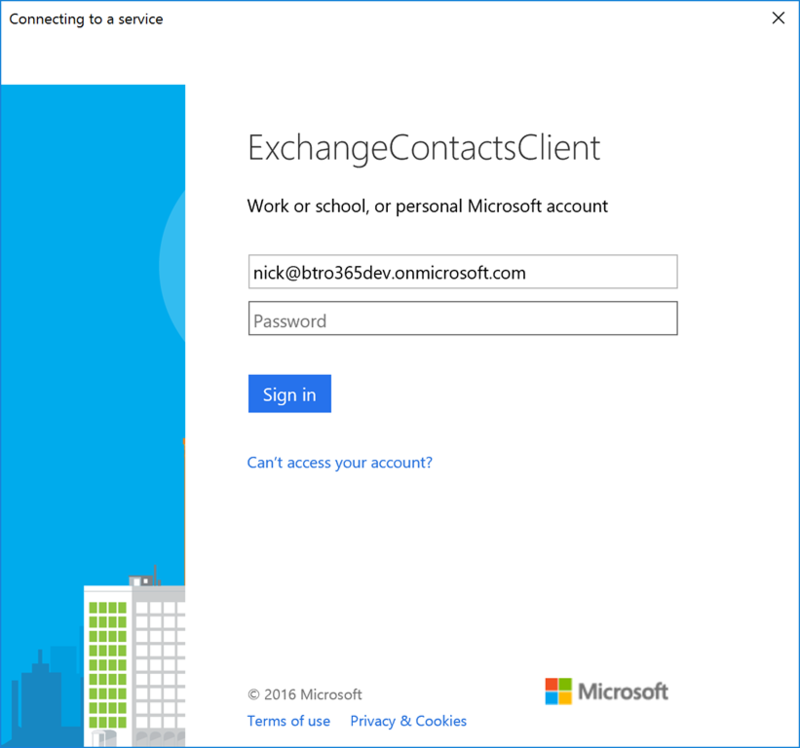 Previously the url included the tenant that the application was registered to ie nicksdemodir.onmicrosoft.com. This needs to be changed in the multi-tenant scenario to use “common”. 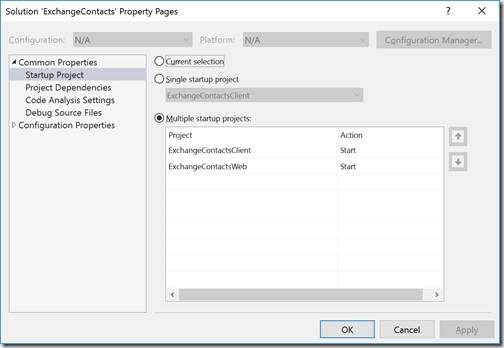 In order to allow authorization to occur for both single and multi-tenant scenarios within the application, I needed a way to dynamically control the token url based on whether the user signed in via the single tenant or multi-tenant authorization url. Currently, all we get back when the user has signed in is a code which we need to exchange for an access token. 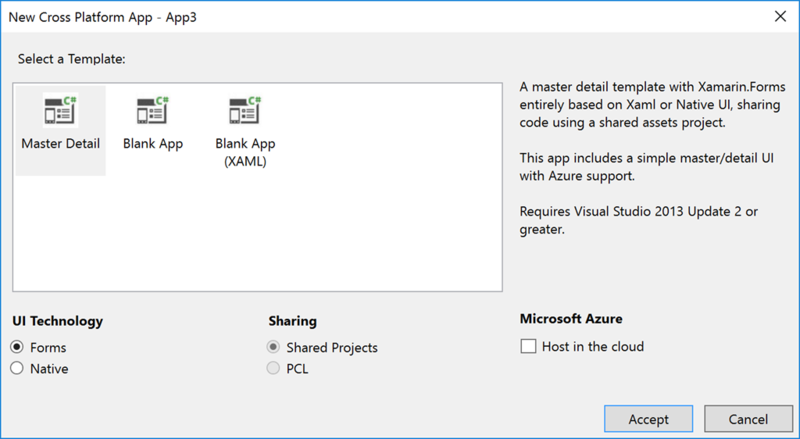 Luckily, we can pass an additional parameter, “state,” into the authorization url, which will get passed back to the application along with the code – we can use this to determine which authorization url was used. 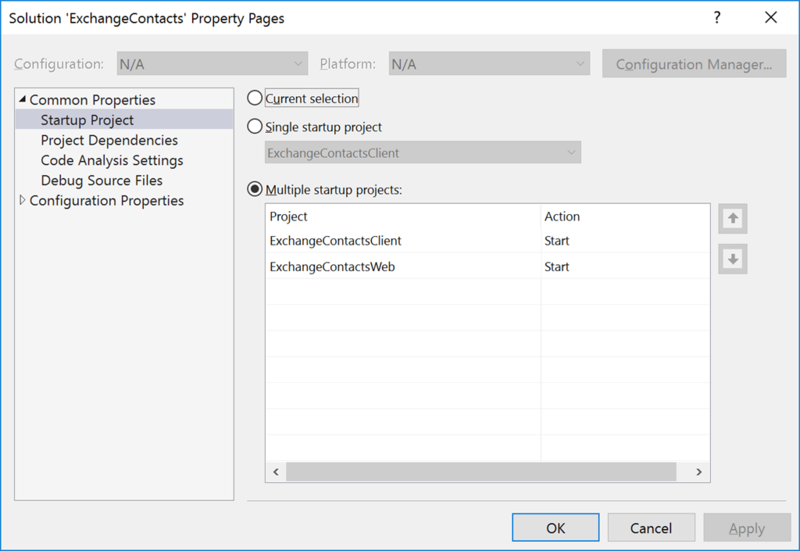 I’m only going to adjust the multi-tenant authorization url as the application will treat the lack of state parameter to mean that the user was directed to the single tenant authorization url. And that’s it – a user can sign in from any tenant (assuming the global administrator has signed in an consented) and retrieve information from the Azure Graph API. 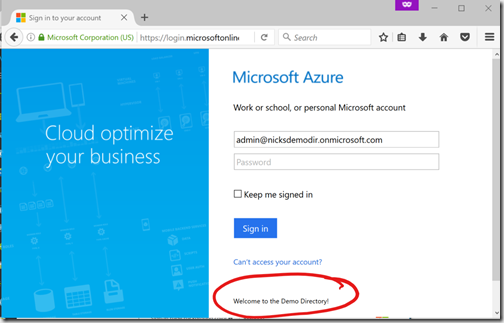 In the previous posts I’ve discussed authenticating and authorizing a user with Azure Active Directory (Azure AD) using a basic application registration. 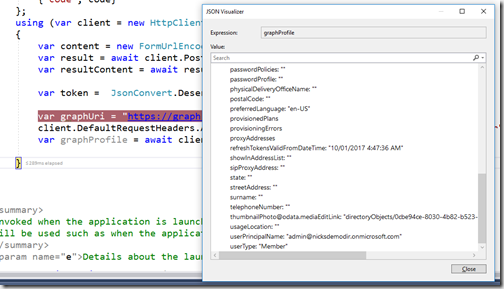 All application registrations are given default permissions to access the Azure Graph API – this was used in my previous post to retrieve information about the signed in user. The default permission set is a delegated permission that allows the user to sign in and view their own profile. 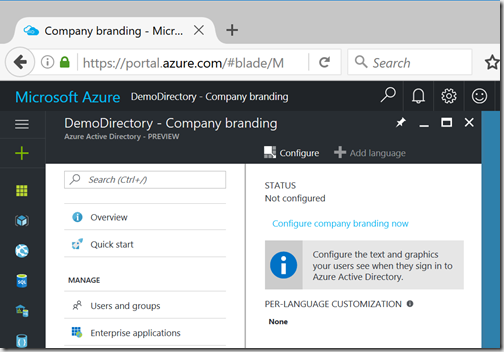 This can be viewed in the Azure portal by extending the Required permissions tab for the application. 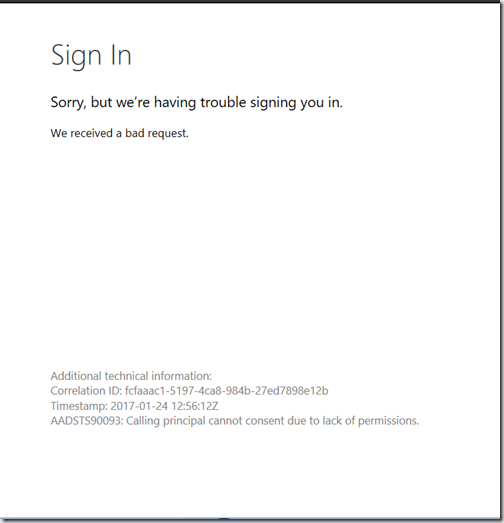 Essentially the error “AADSTS90093: Calling principal cannot consent due to lack of permissions” indicates that a global administrator needs to sign in an consent on behalf of the organisation before users can sign in. If a global administrator signs in, they’ll see a prompt where they can consent permissions – this is slightly confusing as it would imply that the administrator is consenting on behalf of the organisation. Unfortunately this is not the case, they’re only consenting for use by their account. In order for a global administrator to consent on behalf of an organisation, so that all users can make use of the “admin consent” permissions, they have to be directed to a new sign in page with the parameter “prompt=admin_consent” set in the query. In other words, the admin consent url is exactly the same as the authorization url, except it has “&prompt=admin_consent” appended to the end. 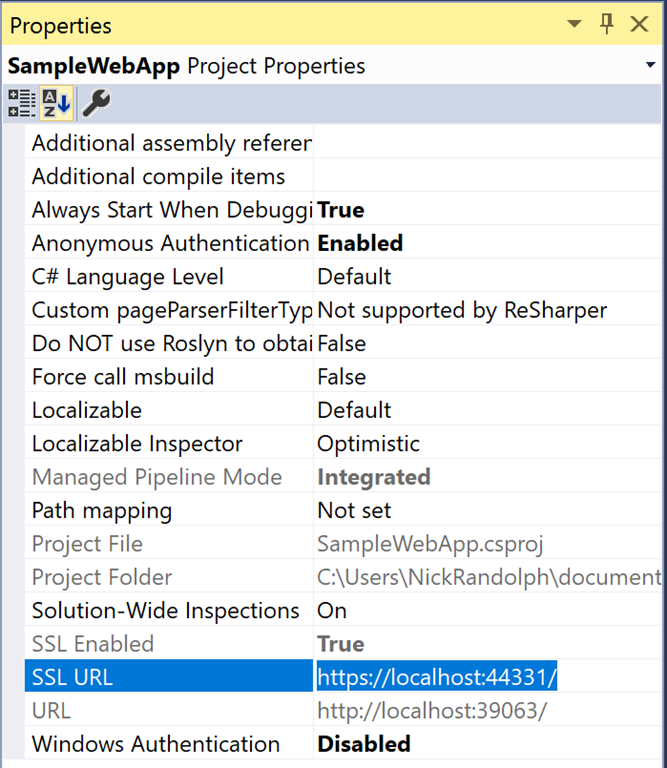 As this is a one-off operation, a global administrator can either navigate to the url in the browser, or the application can have a separate button that would launch the url so that the admin can consent. After the global administrator has consented, user’s will still be prompted to consent but this is for the delegated permission. 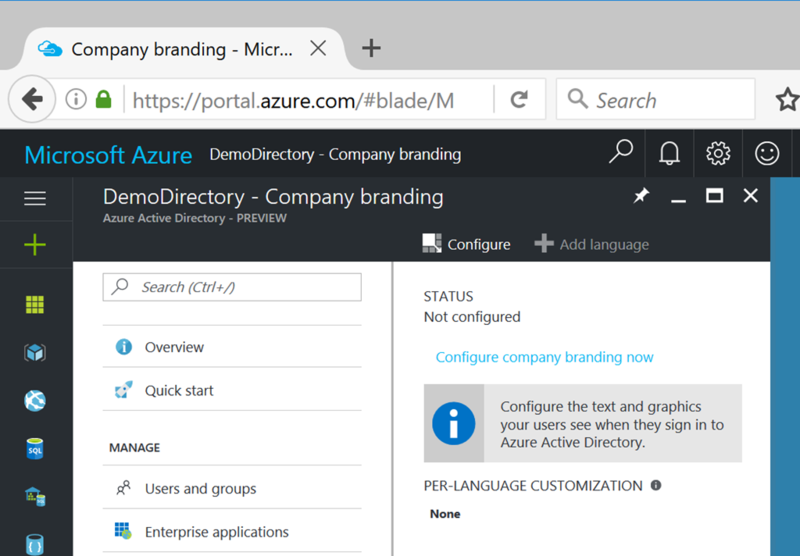 In the same way that user permissions can be revoked by going to https://myapps.microsoft.com and deleting the application entry, organisation permissions can be revoked by opening the Enterprise applications tab for the Active Directory in the Azure portal. Select the application you want to remove and click the Delete button. After the global administrator has consented for the organisation, any user can then read the directory data (ie more than just their own profile). When working with OAuth and Open ID Connect, there are times when you’ll want to inspect the contents of id, access or refresh tokens. 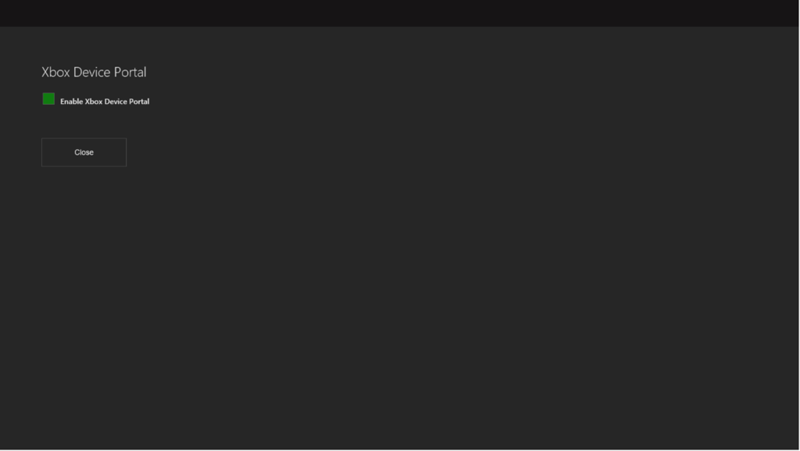 The website https://jwt.io is useful as you can drop in the token in the pane on the left, and the site dynamically decodes the header, body and signature for the JWT. 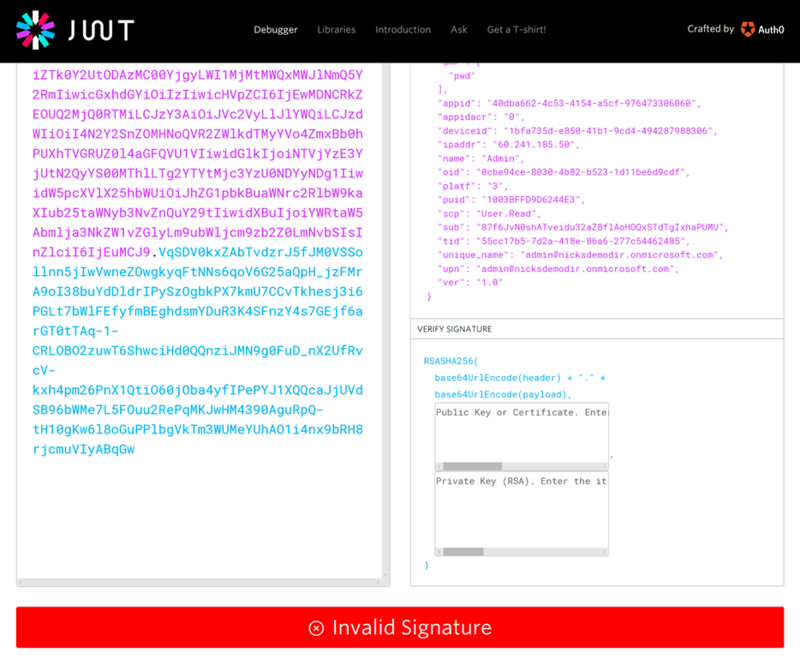 Unfortunately by itself the signature on the JWT can’t be verified as the website doesn’t know what key to use to validate the signature. The header of the JWT does provide information about the algorithm used (ie RS256) and the id of the key used but this by itself isn’t enough to locate the key to be used. 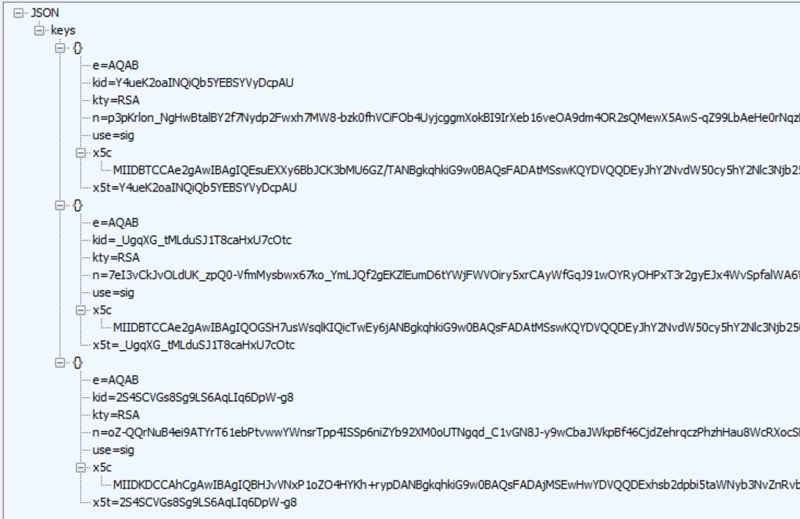 Loading the jwks_uri returns another JSON document which lists a number of keys. Now we can use the kid from the header of the JWT to identify which key to use, in this case the first key in the list. 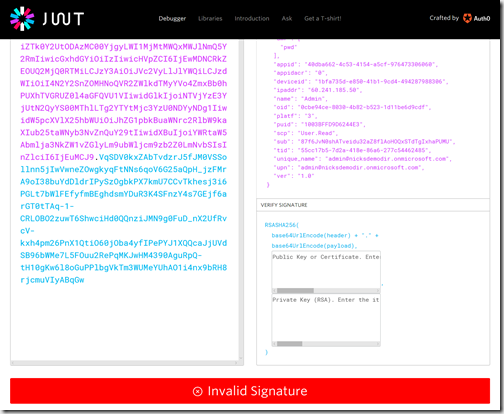 Entering the wrapped key into the Public Key or Certificate box on the jwt.io website will successfully verify the signature of the JWT. To demonstrate this workflow I’m going to adapt the sample application I created in my previous post in order to access the Azure Graph API. The sample application is already configured with access to the Azure Graph API – this is done by default for all application registrations. In order to request access to a resource, you need to know the url of the resource you want to access. 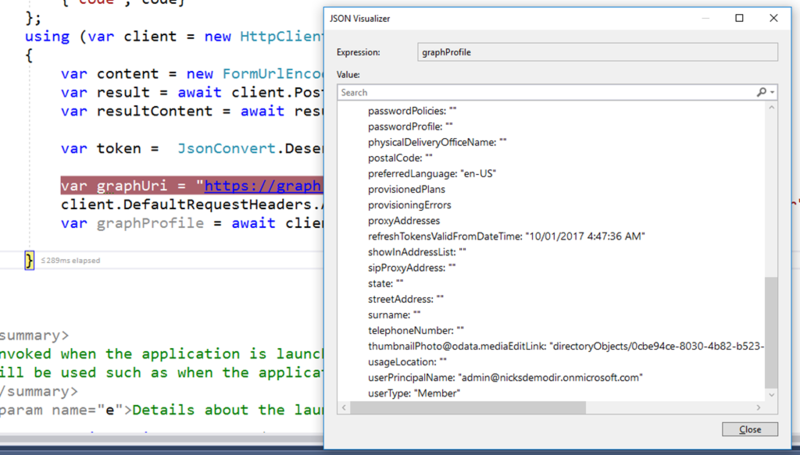 In this case the url for the Azure Graph API is https://graph.windows.net. 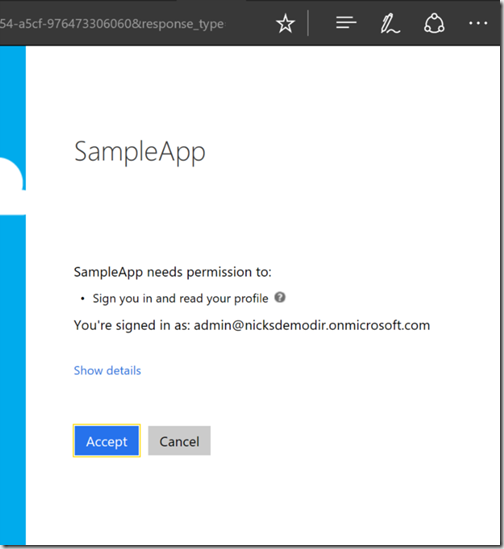 Launching this url in the external browser will again prompt the user to sign in (unless they have previously signed in for this application, such as if you followed my previous post) but rather than immediately being redirected back to the application, the user will see a consent prompt – you’ll note that similar to the sign in prompt, the name of the application specified in Azure AD is used when requesting permissions. 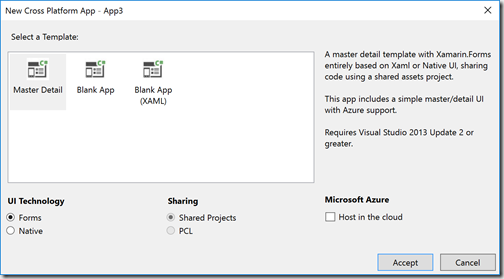 The other thing to note is that once you’ve consented permissions for the application, you won’t be prompted again – Azure AD remembers that you’ve granted permissions. 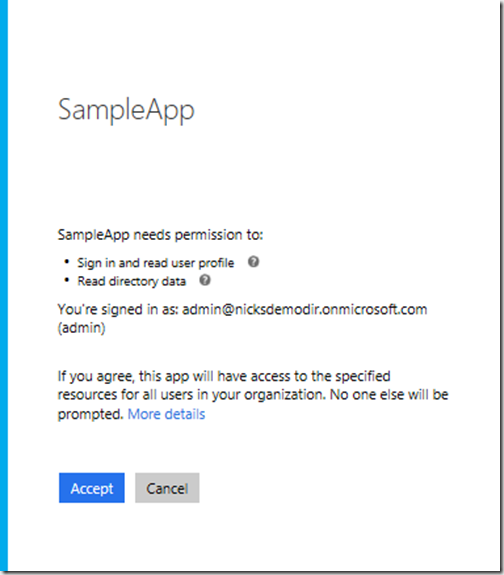 Permissions can be revoked by going to https://myapps.microsoft.com, selecting the application and clicking Remove. 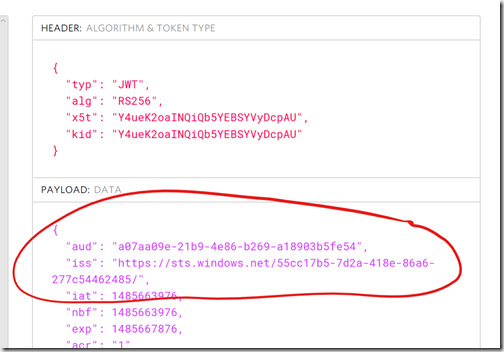 Unlike the id_token, and as you’ll see soon, the access_token, the code is not a jwt token that you can interrogate for information about the signed in user. Instead the next step in the process is to do the code-token exchange to retrieve the required access token. This involves doing a POST request to the Token URL, passing parameters in the body of the request. The resultContent variable will include a JSON string which consists of an access_token, refresh_token etc. Note that the access token is relatively short lived. The refresh token can be used to renew the access token or to retrieve an access token for an alternative resource. At the top of the app registrations pane, click the Add button. 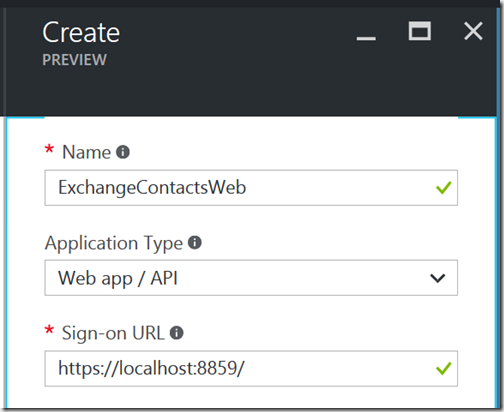 In the Create form I’ll give the application registration a name (the name is used both in the Azure portal as well as on the sign in page when a user is signing into the application). 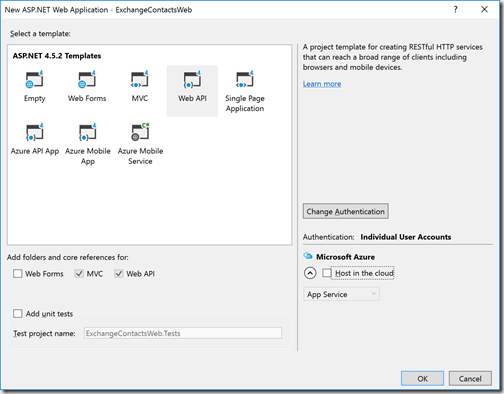 The application type needs to be set to Native – this allows the application to exchange an Authorization Code for an Access Token without having to provide a client secret. The final property is the Redirect URI, which is the URL that the browser will be directed to after the user has signed in. In this case I’m specifying a custom protocol which will be used to redirect back to the application. 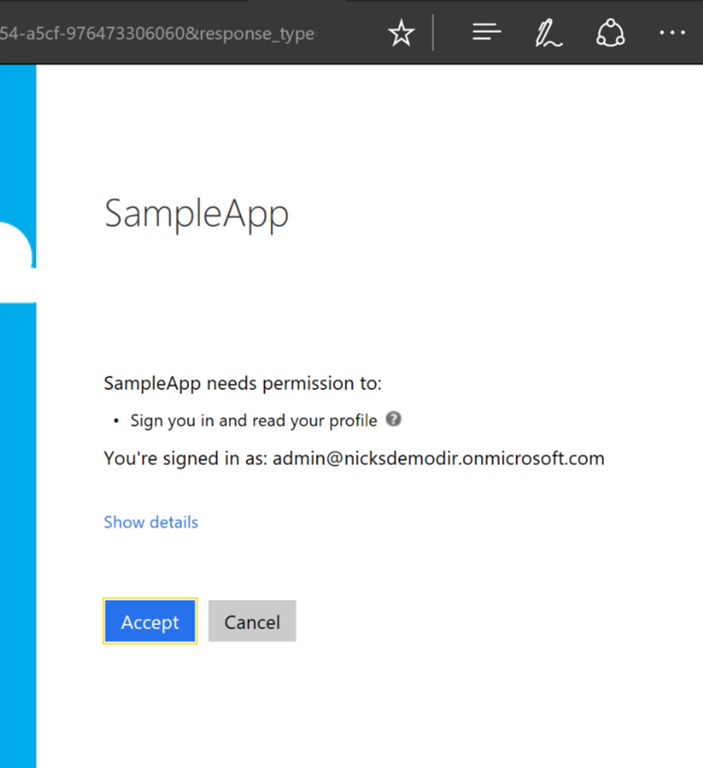 Once the application registration is complete I can copy the Application Id from the application pane. 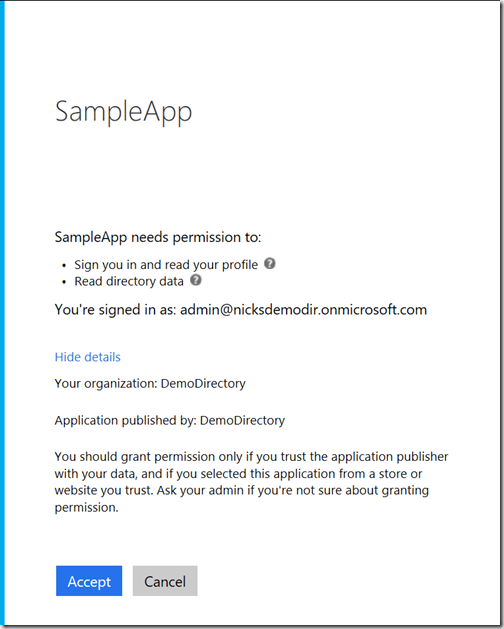 nicksdemodir.onmicrosoft.com – The tenant where the application is registered. Alternatively use “common” for multi-tenanted applications. id_token – This is the requested response, which in this case is a JWT token that represents information about the user. When using OAuth to authorize access to a resource, either specify “code” or “code id_token”. sample://callback – This is the url that the browser will be redirected to after the sign in process has been completed. 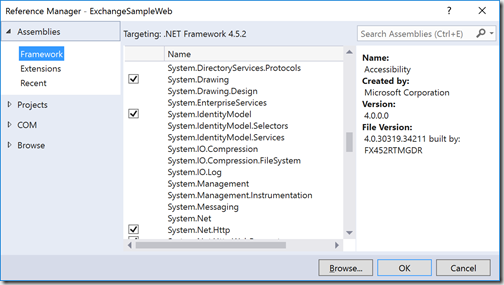 1234 – This is a application specific nonce which can be used to ensure the returned token matches the authentication request from the application. 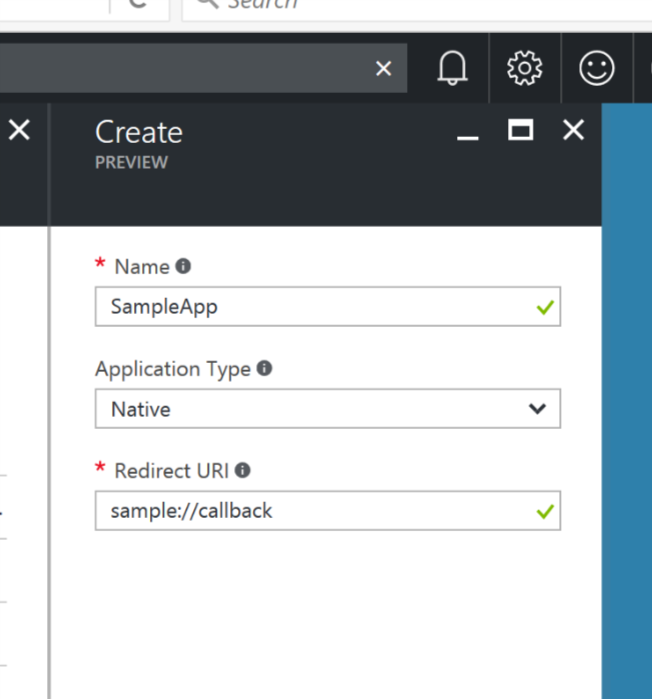 In order for the user to be redirected back to the UWP application the “sample” custom protocol needs to be registered to the application. 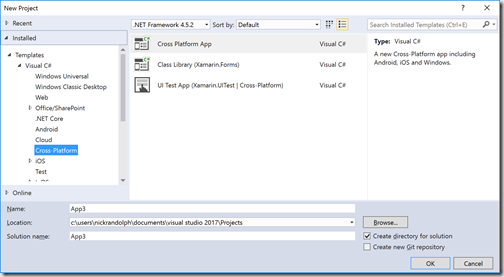 For a UWP application this is done by adding the following XML to the package.appxmanifest, immediately after the closing VisualElements tag. 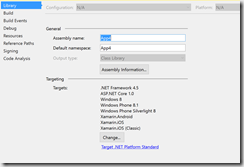 In the App.xaml.cs file for the application, the OnActivated method needs to be overridden. This method will be invoked when the user is switched back to the application after signing in. The args property can be interrogated in order to retrieve the id_token that has information about the authenticated user. 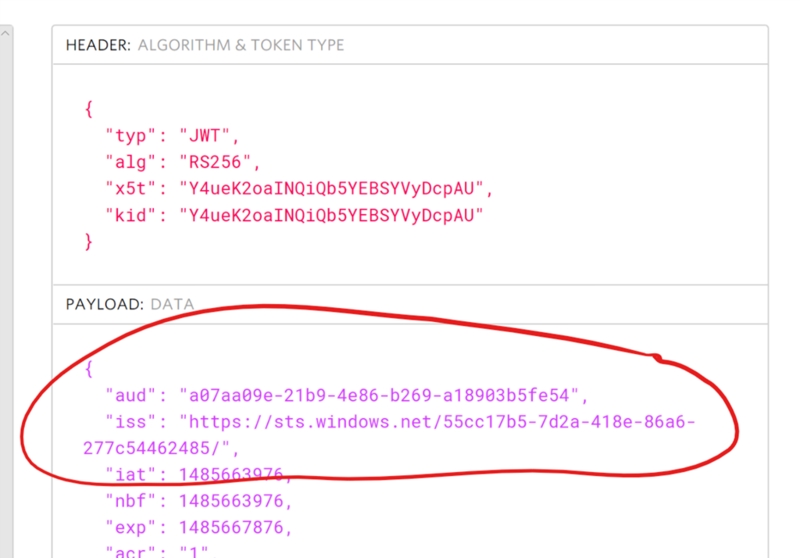 The site http://jwt.io can be used to pull apart the id_token which shows the name of the user that’s signed in. It also shows the nonce which the application can match with the nonce specified in the authentication request. 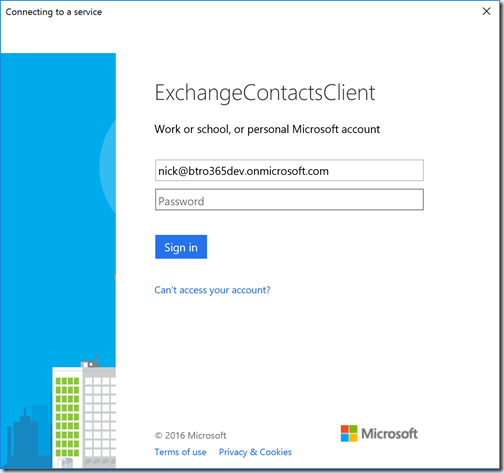 In this post I’ve shown how you can use Azure Active Directory to authenticate a user. Note however, this is not enough to authorize a user for access to any resources. In the next post I’ll walk through using OAuth to authorize user access to a resource.